The start to the 2019 year has been a successful one for us here at APOPO as we continue in our fight against landmines and tuberculosis (TB), with your incredible support. With World TB Day already under our belt and International Landmine Awareness Day still to come this April 4th, we have been able to take time out to review the successes of 2018 and 2019, so far. In 2018 APOPO Cambodia began working in two provinces concurrently, signing a Memorandum of Understanding (MoU) with the Cambodia Mine Action Centre (CMAC) to commence an additional mine clearance project in Preah Vihear province, running in parallel with our Siem Reap operations. Our work was further boosted in late 2018 through a renewed MoU for the continuation of our landmine detection rat and Cambodia Mine Action Centre (CMAC) clearance operations in Siem Reap for 2019. About half of Cambodia’s minefields have been cleared and yet it still remains one of the most heavily impacted countries in the world. Leftover landmines and explosives from conflict are still a major hindrance to the social and economic development of the country. They block access to fertile land for agriculture, water sources, and travel routes, and isolate communities from health services. With among the highest number of landmine victims across the globe, the remaining threat imposes financial and emotional burdens on families needing to care for a landmine survivor. Our renewed MoU with CMAC means we will be able to continue to work to clear land for local communities. CMAC has been integrating our Landmine Detection Rats into its programs since 2015 and we have achieved remarkable results; there is hope that this continuing partnership will enable the clearance of over 1,500,000 square metres in 2019. Since beginning our work in Angola in 2012 APOPO has helped our partner, Norwegian People’s Aid, to find and destroy landmines and other explosive remnants of war, releasing over 1.1 million m2 of safe area and helping thousands of people back on their land. In 2018 our work continued as we welcomed a further 16 Landmine Detection Rats to our Angola operations to further bolster capacity. All 16 rats took the long journey from Dar Es Salaam in Tanzania, arriving successfully in Uíge province, Angola having undertaken, and passed, independent testing by our partner, the National Intersectoral Commission for Demining and Humanitarian Assistance (CNIDAH). Further good news came in the form of a continuation of support from the Stanley Thomas Johnson Foundation, an important partner of our work in Angola since 2017. With their continued support, and the increased capacity from 16 new Landmine Detection Rats, we were able to continue our work to provide a landmine-free Angola to its people by 2025 in accordance with Article 5 of the Anti-Personnel Mine Ban Convention (APMBC). Despite the work already carried out, Angola remains blighted by large swathes of land contaminated by landmines and other explosive remnants of war with an estimated one-fifth of the population being affected. Our work must continue to make an impact to ensure local communities are provided with security, opening up opportunities for development, farming, and recreation without fear. In February 2019, APOPO was delighted to be invited by the Organization for Economic Co-operation and Development (OECD) to share a case study on our TB detection program in the companion volume of the new SDG-themed “Leaving No One Behind” OECD Development Cooperation Report. We live in the era of the Sustainable Development Goals (SDGs). These 17 global goals were set by the United Nations General Assembly in 2015, succeeding the Millennium Development Goals, to collectively work towards “the future we want”. APOPO clearly identifies with the SDG. With our tuberculosis (TB) detection program, we strive for Goal 3: ensuring good health and promoting well-being, and for making our contribution to target 3.3, to end the epidemics of tuberculosis (amongst other diseases) by 2030. APOPO researches TB detection rats which are incredibly fast: one rat can screen 100 samples in just 20 minutes. We use our rapid rats as a “failsafe” – re-evaluating human sputum samples delivered from partner clinics. A sample indicated positive by a rat undergoes confirmation testing with internationally approved tests before the result is returned to the clinic. This approach helps to increase TB case detection by about 40%. By now, we have tested over half a million samples for TB, found more than 14,700 additional TB cases, and have joined forces with community partners to make sure that ‘Test’ also means ‘Treat’. In the last couple of years, partnering with community-based organizations have helped APOPO track down newly diagnosed TB patients in Tanzania and Mozambique and enable 80% of them to promptly start their TB treatment which usually involves the patient taking a combination of different TB drugs. If the correct drugs are taken for the entire duration of treatment, then for most patients this will cure the TB. In spite of our successes, much work remains to realise a world free of mines and TB. We are forging ahead through the course of 2019 with a renewed focus on the continuation of our efforts to bring good health, security, peace and the chance of development to the communities within which we work. With your continued support, we will be able to do so. On that note, GlobalGiving's Little x Little campaign is fast approaching. Between 00:00hrs on April 8th through 23:59hrs on April 12th all eligible donations up to $50 will be matched at 50% at no extra cost to you. There will be $50,000 in matching funds available and we'd love you to help us by making your donation go further! Keep your eyes peeled for our further project appeal email on April 8th. Thank you for your incredible support for our work. It's thanks to your incredible support that we were able to continue our fight against landmines and tuberculosis in late 2018 and early 2019 - we've certainly been kept busy and great progress has been made. From the 24th to 27th of October 2018, we attend the 49th World Conference on Lung Health of International Union Against Tuberculosis and Lung Health (The Union) in The Hague, The Netherlands. The Hague Union conference welcomed more than 4,000 delegates from around the world, and united researchers and health professionals committed to Lung Health and to the fight against tuberculosis (TB). It was inspired by emerging science as well as the recent political commitments made at the UN High-Level Meeting on TB. Our contribution showed that in 2017, after opening the new Dar es Salaam lab and introducing same-day TB testing of the samples, 81% of the newly diagnosed TB patients started TB treatment, compared to 71% in the year before. These results support that the combination of our faster diagnostic service and patient tracking are key in achieving higher treatment initiation rates among TB patients in Tanzania. This month, we reached the landmark of having re-tested over a quarter of a million patients with signs and symptoms of tuberculosis (TB), across sites, since the APOPO TB-detection research program began in 2007. Our programs work within government health systems to support over 100 partner clinics in Tanzania, Mozambique and Ethiopia in their fight against TB. According to estimates of the World Health Organization (WHO), about half of the TB patients in these countries are ‘missed’. Some remain untested or unreported because of social or economic barriers that prevent them from accessing healthcare at their local clinics. Yet even when patients are able to overcome these barriers, the quality of health systems varies and there are limitations to the available diagnostic tools at clinics, resulting in some patients being sent home undiagnosed and without treatment. Globally, the WHO estimates that just over a third of the 10 million TB patients were “missed”, which translates to 3.6 million people each year who have not received a diagnosis or appropriate treatment. To improve detection, diagnosis and treatment rates, WHO, the Stop TB Partnership and the Global Fund launched a new initiative in 2018 which set the target of providing quality care to 40 million people with TB from 2018 to 2022. On 17th December 2018, we met with the Cambodia Mine Action Center's (CMAC) Director-General and His Excellency Heng Ratana in Phnom Penh to sign a memorandum of understanding for the continuation of APOPO’s Mine Detection Rat and CMAC mine clearance operations in Siem Reap province in 2019. His Excellency Heng Ratana explained that CMAC has been integrating mine detection rats into its programs since 2015 and has achieved remarkable results. He hopes this partnership will enable clearing over 1,500,000 m2 in 2019. As part of an integrated capacity, mine detection animals will significantly increase productivity and allow the return of much-needed land back to affected communities more quickly and cost-effectively. On 16th January 2019 we, along with our partner CMAC, were thrilled to announce the completion of a minefield in Dai Ao village of the Sre Noi Commune in Varin District. A handover ceremony was held to release 520,257 square meters of land back to the community that was cleared in the second half of 2018. Thank you for your incredible support through 2018 and into 2019. With your continued support we'll be able to bring safety and good health to the people we serve. It’s almost Giving Tuesday - this year it falls on November 27th (tomorrow). One day of the year dedicated to celebrating generosity and giving back. This year, we ask that you use Giving Tuesday to support APOPO in our big push to clear Cambodia of as many landmines as possible. "My name is Bundoeth and I have been the headmaster of our local primary school for four years. There are 128 children at this school. The school is situated in the middle of what used to be live minefields, on the edge of the main road from Siem Reap." We meet many Cambodians like Bundoeth; people who must consider the threat of stepping on a landmine just to do their job and complete daily tasks that we take for granted. "Many of my pupils have parents, siblings, or grandparents who have been maimed or killed due to leftover landmines from the war"
Whether it is going to school, popping out to the supermarket, farming to feed your family or running a small business too many people are putting themselves in harm's way just to survive. Leftover landmines and explosives threaten more than a third of the world’s countries, including Cambodia, which has the highest number of amputees per capita in the world. These weapons remain active long after hostilities have ended, causing terror, killing indiscriminately and hampering the development of vulnerable communities. Tomorrow, between 00:00:00 ET and 23:59:59 ET you can help us Clear Cambodia. Global Giving are offering to match all new, recurring donations up to $200 per person started on #GivingTuesday and throughout the fundraising season. That's your donation, DOUBLED. There's also a $150,000 incentive fund depending on donations raised, and bonus prizes which mean further funds towards our goal. Remember, just $10 can clear 30 square meters of land for local people removing the threat of loss of life or severe injury. With your generous help, we can Clear Cambodia. It's thanks to your incredible support that we were able to continue our fight against landmines and tuberculosis in July, August and September 2018 - we've certainly been kept busy and great progress has been made. In September 2018, some three years in the making, APOPO received its registration from Angola’s Ministry of Justice which permits APOPO to conduct its humanitarian demining activities independently in Angola. This credential was the first step toward independent registration and licensing with all relevant authorities in Angola which will make way for APOPO’s access to new funding streams and a range of potential partnerships. As APOPO is the only operator with animals, namely mine detection rats (MDR), in the country, humanitarian mine action in Angola would benefit from increased animal detection capacity nationwide in the challenge for completion and an Angola free of landmines. APOPO’s MDR are too light to detonate the landmines and are very quick at finding them, making them a good tool for accelerating detection and clearance. This quarter saw great advances in the fight against TB as heads of state and world leaders got together for the first ever UN annual General Assembly high-level meeting dedicated to fighting tuberculosis (TB). Attendees signed a political declaration with commitments to increase funding, support for research and agreed for more collaboration across sectors and member states in order to end TB by 2030. Every year around the world, 10.4 million new people fall ill with tuberculosis, and 4.1 million of them fail to be diagnosed, treated or reported by health systems. By any standard, the 4,600 people who die of TB every day is an unacceptable level of human suffering and economic burden. Tuberculosis is contagious and airborne. Despite being curable, TB remains the leading cause of death from an infectious disease and the leading killer of people living with HIV. The disease represents a global health security threat and results in high economic and financial burdens to the TB-patients and their families. This month, APOPO hosted two representatives from Angola’s national demining authority the National Intersectorial Commission for Humanitarian Demining and Assistance (CNIDAH), for the independent, external double-blind testing of 16 freshly trained and newly imported mine detection rats (MDR). The two days of testing were held in a former minefield previously cleared by APOPO with the assistance of now retired MDR. The test area had been specially prepared by CNIDAH the month prior with deactivated landmines planted for the MDR and their handlers to find. The accreditation is “double-blind” because the MDR and the handlers are unaware of the locations of the targets, which are known only to CNIDAH who have them marked on a map. Each of 16 MDR were subjected to a search of 200 square metres, and all 16 of the MDR correctly indicated the targets within a one-meter radius of the target, with not a single one missed. This reflects the high level of mine detection skill of the MDR and their handlers as well as the quality of the breeding and training at APOPO’s Headquarters and training centre in Morogoro, Tanzania. “I credit APOPO’s training team in Tanzania for preparing a fine group of detection rats, which quickly acclimatised to our premises in Uíge, and demonstrated strong positive behaviour that is easy for handlers to recognise." Zacarias - MDR Supervisor. “I was excited to meet the 16 new MDRs at the airport in Luanda after having waited anxiously for them since they departed APOPO’s headquarters in early May. They have impressively proved themselves as Angola’s next team of mine detection rats to take on our next tasked minefields in Angola. With accreditation now out of the way, as soon as we have the certificate from CNIDAH in Luanda, APOPO will immediately deploy the MDR to an ongoing task in Uíge Province located in the district of Quitexe. The minefield was a former military position and camp, and once free from all hazards, the area will used for expansion of the nearby village and for agriculture." Alfredo - MDR Supervisor. APOPO sincerely thanks our wonderful donors and partners for making APOPO’s life-saving work in Angola possible. 100% Match of your Mother's Day Donation! With Mother's Day fast approaching, why not send a donation in honor of your Mom? From 1st to 13th May 2018, GlobalGiving will match 100% of all new, recurring donations received by APOPO. The donations we receive go towards empowering mothers across the globe - mothers like Gloria who strive day in, day out to look after their families through incredible adversities and hardship. Gloria is a widowed grandmother, smallholder, and head of her family. For years she struggled with having to farm land contaminated with unexploded landmines in order to provide food for her family. With APOPO's help, Gloria and her family are now able to farm a large area of land previously off-limits to them - they're able to farm safely, in the knowledge that they won't lose life or limb to a landmine. This Mother's Day, why not give a gift that gives back? Instead of showering your Mom with flowers, how about giving a donation in her honour which will be used to help empower the moms, mums and mamas we work with across the globe. By giving a donation in honour of your Mom, you'll be helping women like Sharifa continue to lead and care for their families. "My name is Sharifa and this is my baby Ramadhani. I live in Dar es Salaam in an area called Manzese. During my pregnancy I fell ill. I had a bad cough and I lost a lot of weight instead of gaining it. I became very weak. As a result I wasn’t able to look after my family. I had had tuberculosis in 2008 and my symptoms were very similar this time again so I went to the hospital for a TB test. When they told me the result was negative, I got very worried. I had to rest but I wasn’t receiving any treatment and kept getting worse. I was in very bad shape and at one point even became afraid my baby wouldn’t make it. After a few days I got a call from a lady from MKUTA. She wanted to see me and visited me at home to explain they had sent my sputum sample to APOPO where it was retested and they had found tuberculosis. She also told me it was rats who had found the disease! At first I couldn’t believe it but she assured me it was true - APOPO's lab had confirmed it with microscopy. I’m so happy I was diagnosed and could start treatment. I recovered quickly and now both my baby and me are doing well. When I meet other mothers with children I tell them my story and make sure they know what to do if they ever have symptoms that might suggest tuberculosis." Every day, thousands of deminers around the world risk their lives when clearing landmines in an effort to help the communities who live in terror of these insidious, hidden weapons. For deminers, International Landmine Awareness Day is just a regular day, no different to any other day on the minefield. For APOPO, this day is an opportunity to highlight their courage, to raise awareness of the landmine issue, and to celebrate what has so far been achieved, whilst keeping in context the hard work that remains to be done. The focus this year for landmine awareness day is on protection, peace and development. Despite mine action efforts around the world, people are regularly killed and maimed from landmines and other leftover explosives. Children are at risk by playing near their houses or travelling op school, their parents overcome terror every day to work their land and provide for their family. Mine Action is about protecting people and their livelihoods from weapons that were laid for reasons that had mostly nothing to do with them in the first place. Yet, it is the local communities who now bear the brunt of these forgotten, hidden killers. APOPO, through its mine detection rats, is committed to clearing landmines and releasing land at an accelerated pace, helping to protecting more people and ensuring that children can grow up in a safe environment. Yet the need for protection against landmines is not unique to humans. Mines are also found in isolated areas where endangered wildlife roams, such as along the border between South West Zimbabwe and Mozambique. APOPO’s program there is located in a wildlife corridor and designated conservation area, and aims to protect elephants lion and other animals as they move from one protected area to another. The road to peace is shorter when there is hope for improvement and normalisation of life. Clearing mines is an integrated element of building lasting peace and stability after war by returning safe, productive land to communities who for decades have been crammed together on land whose agricultural fertility steadily deteriorates with over-farming, whilst space for development and expansion is unavailable. Preconditions for peace also require peace building initiatives, including safe movement of peacekeepers and aid workers, along with distribution of humanitarian aid. The presence of landmines can severely inhibit these efforts leaving communities even isolated and sometimes lawless. The presence of landmines and ERW will always impede development in one way or another, yet the full implications of landmine contamination on a country are often little known, poorly understood, badly documented and wholly underrated. Rural communities may be prevented from cultivation of land and herding their livestock, thus triggering reliance of humanitarian aid. Development initiatives themselves are often hemmed in and hampered, preventing sustainable development and prolonging dependency of such aid. Rehabilitation of infrastructure can be similarly restricted, preventing economic growth and provision of basic services. Clearing the landmines allows settlement into new areas in contrast to prolonged urbanisation because of war. Angola is an example of a country where migration of people from excess urbanised areas into rural areas is hampered because of landmines. The Anti-personnel Mine Ban Convention (APMBC) has adapted the goal to “accomplish all outstanding obligations under the Convention, to the fullest extent possible, by 2025”. This is for the most part achievable if states, donors and mine action organisations give it the priority it deserves and continue with current or probably higher levels of funding. APOPO has for 20 years developed and improved the use of animals for landmine detection. Our efforts ensure more expedient protection of civilians and animals and support peace building and development in mine affected areas. Integrated Mine Detection Rats teams can triple the overall efficiency of a land release process compared manual mine clearance used alone. Through partnership with other mine action organisations, we can ensure a much wider deployment of rats into more mine affected countries. Our goal is to help vulnerable groups in mine affected countries. We have been successful in doing this in Mozambique, Angola and Cambodia and we strive to expand our efforts into Zimbabwe and Colombia. We have also deployed animals in South Sudan and with partners, we could further expand into more mine affected countries and territories. The International Mine Action day is also the occasion to honour field staff of APOPO and all other mine action organisations who daily risk their lives to achieve our shared goal. The work of these people may not be easily noticed but is greatly appreciated. Themed “Wanted: Leaders for a TB-free World”, a 'TB leader', according to the Stop TB Partnership, is a head of state, minister, mayor, governor, parliamentarian or community leader. At APOPO, in our 20-year history and one-and-half decades of TB research, we have encountered many of these formidable TB leaders who have contributed to the cause through ideas, vision, hands-on support, collaboration and financial assistance to embark on something new: to train rats to detect TB. APOPO’s operational headquarters and first TB research site began in 2002 in Tanzania, supported by the Sokoine University of Agriculture. Research in Mozambique (since 2013) and Ethiopia (2018) has followed. These three countries have a common cause in that they face a high TB burden with approximately half of their nationwide TB patients remaining undetected. These ‘missed’ TB positive patients often include the most vulnerable, and those without proper access to care. Left untreated TB patients can pass on the pathogen to others, and up to two thirds of TB patients will eventually die. APOPO is conducting on-going research into developing and deploying TB detection rats as a diagnostic tool. In brief, human sputum samples are collected from partner DOTS clinics that have already tested them for TB using locally available sputum smear microscopy, which has a limited sensitivity. Rats re-test these (heat-inactivated) samples and make additional positive indications that are then rechecked using WHO endorsed confirmation tests such as LED fluorescence microscopy. Confirmed TB-positive results are conveyed to clinics that orchestrate patient treatment. This research approach raises our partner clinic detection rates by 40%. The action does not end here. We are engaging in partnerships with community health workers – often former TB patients who have decided to join patient organizations and take a lead – guiding newly diagnosed TB patients and linking them to care. The sample evaluation by rats also feeds into basic research on scent detection and on biomarkers, i.e. what the rats actually smell. The research on the rats may lead and guide the development and refinement of synthetic diagnostic devices, such as e-noses. That this innovation roots in Tanzania is not by coincidence; the United Republic of Tanzania is a TB leader itself. It is in Tanzania where the first national, nationwide tuberculosis program was founded - the NTLP (Tanzanian National Tuberculosis and Leprosy Programme) - and it was here, where the shorter, supervised anti-TB treatment has been trialled in the hope of achieving higher cure rates. Tanzania’s research and experience would later feed into the new control strategy of the WHO. APOPO thanks health authorities across the countries in which it works for their continued support, in addition to funding partners. Many people working for APOPO have personally experienced the devastation that undetected landmines can cause. APOPO rat handler Malen was kind enough to share her history of being part of a community living in fear. Malen grew up in a small village in Svay Rieng near the border with Vietnam. Her community was made up of a few farming families that cultivated the land. Except that the land was riddled with landmines from Cambodia’s long years of conflict. When Malen was only four years old she witnessed a man she knew from the village step on a landmine and lose both his legs. In fact, Malen’s passion to join APOPO was driven from her own experiences when she was growing up, of the devastation caused by the explosive hazards left from the conflict. Data collected by the landmine monitor show that the majority of casualties (84%) are men and boys. But women and girls are perhaps more vulnerable to the indirect impact of landmines — economically, socially and emotionally. Malen has seen first-hand the unspeakable physical and emotional impact that landmines enact. This horrific memory has always stayed with Malen and she is determined to make a difference. Sadly, her story reflects reality for thousands of Cambodian families. “I joined the Cambodia Mine Action Center (CMAC) in 2009 because I wanted to become a deminer. My parents did not want me to take the job because they thought it was too dangerous.” said Malen. When Malen heard about the new partnership with APOPO and CMAC in 2015 she immediately signed up to join the rat teams. “I love animals and was intrigued by the rats. When I heard how quickly they can find landmines I knew I wanted to become a rat handler.” Malen is proud to be part of a partnership between CMAC and APOPO that is helping communities who are in dire straits. She is also is grateful for the chance it has given her to learn about rats and what their amazing sense of smell can do. “My favorite rat is Isaac - he was the first rat that I worked with, and he finds the landmines so quickly. But don’t get me wrong…finding and destroying landmines is hard work." Cultural norms in Cambodia mean that in some communities Malen will still need to overcome the judgment of her working in a role that is considered a “man’s job.” She is prepared for this and hopes that by example she will inspire other Cambodian women to join APOPO and CMAC in the future. New Year's Resolution: Save More Lives! 2017 marked two decades since the Mine Ban Treaty (Ottawa Treaty) was adopted and signed by 122 countries in Ottawa, Canada. The treaty, which bans the use, production and storing of landmines, now lists 163 countries as signatories, whose representatives have come together to assess the current situation, discuss challenges and confirm commitments for a mine-free world by 2025. Over 40 million landmines have been destroyed by state parties signed to the treaty, and 143 of them no longer hold a stockpile. This represents an outstanding rate of compliance. Most importantly, the number of new mine victims has fallen. “After 20 years, the Ottawa Treaty has significantly driven the clearance and destructions of millions of landmines all over the world as well as raised awareness of the plight of people still living in terror due to these insidious weapons.” - Håvard Bach, Head of APOPO Mine Action. The international mine action community has set a target to make the world free of landmines by the year 2025 and much work needs to be done in order to achieve this goal. People living in countries from Angola to Cambodia and Zimbabwe, do so in daily fear from these savage remnants of conflicts that ended decades ago. APOPO’s mine detection rats are an effective technology that is proven to speed up mine action when integrated into existing methods. With a spirit of partnership, APOPO calls on other operators to come and discuss how we can integrate with their technology and methodology. From APOPO’s humble beginnings to our present day status as a global organization, APOPO is proud to celebrate 20 years of detecting two of the deadliest threats on the planet: landmines and tuberculosis. The HeroRATs have helped clear over 106,000 landmines, identified over 12,000 TB-Positive patients who were missed by their clinics, and prevented almost 90,000 potential infections of tuberculosis – the world’s biggest infectious disease killer. 20 years ago Bart Weetjens, a product design ex-student from Antwerp University in Belgium, called his friend Christophe Cox and Mic Billet to tell them about an idea he’d had about training rats to find landmines, freeing nearby communities from terror and hardship. The project was presented to the Belgian Government who provided a feasibility grant in November 1997 and the APOPO project was born. APOPO and the HeroRATs have since been saving lives all over the world. Harnessing the highly attuned sense of smell in the African giant pouched rat, APOPO has spent the last two decades training these affectionate rodents in detecting two of the deadliest threats on the planet: landmines and tuberculosis. Each gives off its own unique smell, undetectable to humans, something which the rats are able to quickly sniff out. Twenty years later, APOPO has now faced the landmine issue in seven countries, including Cambodia, Angola and, notably, Mozambique, where it played a key role in the country achieving ‘mine-free’ status in 2015. APOPO is now looking at opportunities to eliminate landmines in former FARC territories in Colombia, where minimal-metal mines aren’t easily detected by metal detectors, and in the Great Limpopo Transfrontier Park in Zimbabwe, where APOPO expects to soon begin work detecting mines along important migration routes for elephants, buffalo, lions and other protected wildlife. In addition, APOPO’s TB-detection programs are expanding in Tanzania and Mozambique and will soon be operational in Ethiopia. APOPO is also exploring using rats for search and rescue operations, particularly in collapsed buildings, and even in sniffing out brain disease. Twenty years after the Ottawa landmine treaty was signed, there is still work to be done. To this day, 58 countries are still plagued by as many as 110 million landmines buried in the ground. However, global financial support for mine clearance is declining, necessitating a faster way to find the landmines. APOPO’s goal is to become the go-to resource in accelerating the pace of landmine clearance as the world races to accomplish the Ottawa Treaty target of eliminating all landmines by 2025. In order to do this, APOPO’s HeroRATs could be the key to speeding up the decades long process. Thank you to our amazing donors. Whether you have been with us since the beginning, or are new to our community, we are proud to call you our supporter. Since 2017, APOPO offers fast innovative TB diagnostics with the help of African giant pouched rats, nicknamed HeroRATs. The rats can check 100 samples in around 20 minutes. This would take a lab technician up to four days. Across sites, APOPO HeroRATs have helped increase clinic detection rates by 40%. In the past, APOPO transferred samples collected from collaborating clinics in Dar es Salaam to Morogoro. Due to the distance from Dar es Salaam, however, patients often dropped out of the system before the APOPO results could be delivered, and missed out on life saving TB treatment. With the new facility in the city, APOPO strived for same day testing of the samples and delivery of results within 24 hours so patients get them when they return to clinic for their standard results. A similar model has been previously implemented in Maputo, Mozambique. Our experience over the first year is striking: The number of collaborating clinics has increased from 24 to 41 and the monthly sample volume in Dar es Salaam has more than doubled to over 4,500 samples evaluated by the HeroRATs in October 2017. 24-hour result turnaround was achieved whenever samples could be made available by the clinics for collection. Most importantly, in the past months, more than 80% or 90% of the additional patients were successfully linked to care (compared to 70% in the previous year), receiving appropriate anti-TB treatment at the clinic. This clearly highlights the role of good service delivery in achieving health benefits, and supports the need for holistic approaches linking case detection to care. Leila is 13 years old and lives in a small house in Dar Es Salaam, Tanzania. She suddenly developed a severe headache, high fever and extreme fatigue. “I was unable to attend school and had to stay at home. The TB test at the hospital showed a negative result. My grandparents were anxious because we did not have a diagnosis. Then, I was informed that my sputum sample had been retested in Morogoro by APOPO and found to be positive for tuberculosis. We were relieved to hear that my illness could finally be treated! Please continue to support APOPO! More work needs to be done to help children like Leila. Tuberculosis remains the deadliest infectious disease – despite being curable and preventable. The WHO estimates that there were 10.4 million new cases worldwide in 2016, and over 1.7 million deaths, including 0.4 million among people with HIV. An estimated 4.1 million were never diagnosed or reported. A gap we are contributing to close in our sites of operations. It’s the dawn of a new era for Zimbabwe, following an incredibly peaceful end to the 37-year rule of Robert Mugabe. APOPO is proud to support the new Zimbabwe by helping to clear its lethal landmines. These landmines are located in the heart of the Great Limpopo Transfrontier Park (GLTP), the largest conservation area in the world, where not only communities, but also many endangered species such as elephants, lions, wild dogs and many more are affected by the land mines. The GLTP includes three iconic National Parks (NP) spanning three countries; Kruger NP in South Africa; Limpopo NP in Mozambique; Gonarezhou NP in Zimbabwe. APOPO’s minefield is found in the Sengwe Wildlife Corridor, a specifically designated area aimed at allowing free movement of wildlife between Kruger NP and Gonarezhou NP. The minefield runs for 37km with one of the highest landmine densities in the world (about 5,500 mines per km), causing a serious threat to already endangered wildlife and communities living in the area. Gonarezhou NP boasts a population of over 11,000 African elephants, one of the largest in Africa. Kruger NP also has a similar sized population. Given the general continental decline of the African elephant, it is paramount for the long-term wellbeing of the species that these two healthy populations have safe access to interaction. APOPO feels privileged to be here during this historic transition and wishes to play a role in the creation of a safer and more prosperous Zimbabwe. We are currently fundraising to be able to commence our demining operation in the Sengwe Wildlife Corridor early next year. For the first time since the end of the civil war, the Cambodian Mine Action Authority (CMAA) recorded no casualties in Cambodia for a whole month. The first half of this year has also shown a drop in 40% of deaths and injuries from old landmines and unexploded ordnance (UXO) compared to the same period last year. It is unheard of that since CMAA began recording incidents in 1979, that there has been a whole month free from casualties. This is a very encouraging sign and APOPO and partner CMAC are thrilled that the impact of our work in Cambodia becomes evident in ways like this. “Seeing the rats finding the landmines so quickly is amazing! We work on zones the size of a tennis court, and they take about 30 minutes to check it. This could take me up to four days with a metal detector because of all the false alarms from scrap metal, which of course we have to check in case they are actually landmines." says Sophea, one of the APOPO Rat handlers. Used as a unique add-on to conventional detection methods, APOPOs Mine Detection Rats are proven to significantly speed up conventional landmine detection methods and return safe land to vulnerable communities as quickly and cost-effectively as possible. Cambodia is one of the most landmine-affected countries in the world, the result of 3 decades of conflict which persisted until the late 1990’s. The impact of these weapons is long lasting and devastating. Landmines keep people poor and their presence stands in the way of socio-economic growth for communities living in contaminated environments. Mines prevent access to land for agriculture, resettlement and other infrastructure developments such as roads, schools and water catchment ponds. Removing mines is therefore essential for the lives and livelihoods of the Cambodian population. Your donation has led to this amazing accomplishment and we are incredibly appreciative. Of course, there is a lot more work to be done to rid the country of landmines completely, but together with our HeroRATs and your support, we will get there faster! Sadly, for many people in Cambodia, living with the threat of landmines is a daily occurrence. Over 64,000 landmine and other Explosive Remnants of War (ERW) casualties have been recorded in Cambodia since 1979. With over 25,000 amputees, Cambodia has the highest ratio of mine amputees per capita in the world. APOPO along with local partner the Cambodian Mine Action Centre (CMAC) is conducting humanitarian landmine clearance projects in Oddar Meanchey and Siem Reap Provinces targeting the most mine-affected villages in order to return mine-free land back to communities where it makes the biggest impact. Chun is a farmer with eight children. He has worked his farm the whole of his life. During the war we endured many battles near and on our land. It was a very frightening time. There were soldiers everywhere, either resting or fighting. We saw things we would like to forget. When the war finished it became peaceful for us and all the other families in the area. But our land was not the same. There were unexploded bombs in our field. Many were lying on the ground, but lots were hidden in undergrowth or under the earth. It was very dangerous but we had to keep working in the fields to feed ourselves. I was so terrified for my children. I forbade them to go to the fields, but the explosives are everywhere. What if they stood on a landmine or picked up an old bomb? For many people like Chun, it is not just the fear of standing on a landmine, but the financial impact often shared throughout the community. I called the EOD team and they arrived straight away. They told us to stay away and they went to the tree. They found an old mortar bomb and they used metal detectors to check all around the spot in case there was more. The Team Leader told me that long ago a farmer must have found it in a field and moved it away under the tree out of his way. It could have blown up in his hands, but in those days there was no EOD team! We all want to rid our land of landmines as soon as possible and together with our HeroRATs we will get there faster! New jobs for the HeroRATs! Due to your kind and generous support, we are thrilled to announce that APOPO will soon be saving lives in Colombia. Colombia's landmine and Explosive Remnants of War (ERW) problem is the result of more than five decades of conflict with non-state armed groups. Up until December 2016, the official government record states there have been a total of 11,460 landmine casualties, of which, 2,266 people died and 9,194 were injured. This places Colombia second in the world only to Afghanistan in terms of landmine casualties. 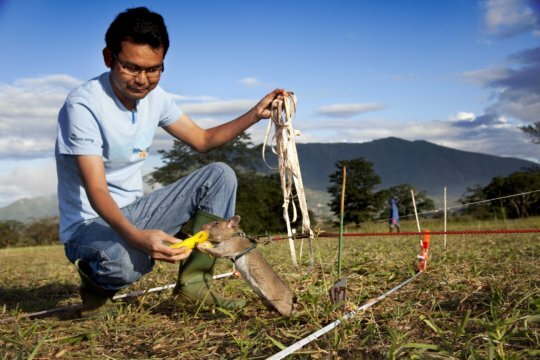 APOPO is proud to announce that it has opened a landmine detection program in Colombia. APOPO has recently registered as an NGO in the country and has asked the Colombian government to consider the use of APOPO's innovative landmine detection rats as effective detectors of minimal-metal landmines. Thanks to your generosity, APOPO and the HeroRATs were very successful in clearing landmines in Mozambique. “The landmines caused us a lot of problems and pain. People within our community became disabled and some died through landmine accidents. Once a farmer found a mine and took it home to show to his children. It exploded in their house. After the news of this tragedy went around, we were all terrified. The landmines cut us off from important resources such as water and fertile land that we used to farm. We are not rich people. Our land and livestock are our assets, so if you take these away, or we become injured, our ability to provide for our families is also lost. We want to take our success from Mozambique and help people in Colombia to live free from the scourge of landmines. Please continue to help us save lives. We are thrilled to announce that the HeroRAT TB Detection Facility in Dar es Salaam, Tanzania is now open! The new facility will now deliver APOPO results within 24 hours so patients get them when they return to clinic for their standard results, vastly increasing the number of people getting on treatment. There are 10 TB-detecting HeroRATs working at the lab alongside 12 staff made up of rat handlers and lab technicians. Despite being curable and preventable, tuberculosis is a deadly infection of the lungs that kills about 1.8 million every year, including 400,000 among people with HIV. Over 30% of all estimated TB cases are not detected or treated properly. APOPO offers fast innovative TB diagnostics in the form of African giant pouched rats, nicknamed HeroRATs. The HeroRATs can check an incredible 100 samples in around 20 minutes. This would take a lab technician in a public clinic up to four days. Since 2007 the APOPO HeroRATs have helped increase clinic detection rates by over 40%. In the past, due to APOPO’s distance from Dar es Salaam, patients often dropped out of the system before the APOPO results could be delivered, and missed out on life saving TB treatment. Claudi is six years old. Last year he was very sick and the local clinic did not know why until APOPO HeroRATs detected his illness as TB. They saved his life. Claudi lives with his parents and 6 brothers and sisters in 3 tiny rooms in a little house in Dar Es Salaam. Last year both his parents and one of his sisters became very ill. They were all diagnosed with Tuberculosis. Then he started coughing and had a high fever. He also began feeling very tired. His parents took him to the hospital for a TB test but it was negative. Everyone was very worried but nobody knew what the problem was. Claudi is feeling much better now and has found a new fondness for rats. By donating to APOPO, you have done a wonderful thing and helped to save the life of people like Claudi. About 9 million people are diagnosed with TB every year. The HeroRATs and APOPO are continuing to help some of the most vulnerable people in the world overcome this disease, but we can't do this without your continued support. Boom - 80 Tons Destroyed! Since late 2015, APOPO has been carrying out controlled bulk demolitions as an integral part of its unexploded ordnance (UXO) and ammunitions clearance in the Malhazine Complex in Maputo, Mozambique. APOPO has safely executed 17 bulk demolitions destroying 80 tons. Mozambique’s landmine problem was once one of the most severe in the world, with a legacy of landmines and explosive remnants of war from decades of conflict. Tens of thousands of landmines were laid in the country during its 1964-1975 fight for independence and throughout the civil war that followed. “My family lives near pylons that were mined in the civil war to protect them from sabotage. My friend was killed trying to retrieve his cow from the mined field. Sometimes we had to take risks and farm the land or cross it for a shortcut. I found my children playing there. Then APOPO arrived to clear the fields. They used machines, manual deminers and mine detection rats. At some pylons, they found no mines, at others there were many. Some items are highly degraded and fused making them quite dangerous and unstable while others are un-fused and appear in relatively good condition. APOPO is on an on-going basis organizing and preparing these items for safe destruction. Due to the trauma the local community suffered during the two main explosions in 1985 and 2007, APOPO is not permitted to make in situ demolitions, as it would result in mass panic in the densely populated areas directly around Malhazine. For this reason, APOPO makes the demolitions at the designated Central Demolition Site (CDS), in Moamba about 70km from APOPO's operations in Malhazine. At this time, APOPO is actively fundraising to resume ammunitions clearance operations in 2017. APOPO has been tasked by the IND & CIPEM to clear two additional areas in the Malhazine Complex, and hopes to soon have sufficient funding confirmed to begin working on the new tasks in January. Thank you for your support. We are very appreciative. Cambodian Minefield Cleared and Baby HeroPUPS! The HeroRATs in Cambodia have helped our partner CMAC complete clearance of a second minefield since they were deployed at the beginning of the year. Eight families, totaling around 40 people, have lived next door to the landmines for the last 25 years and have been forced to sometime farm on unsafe land in order to feed themselves. They are already getting on with the serious business of growing rice crops on the newly safe land. 13 Mine Detection Rats were deployed alongside CMAC demining teams. These HeroRATs are the ‘landmine detectors’ that significantly speed up landmine clearance because they are trained to detect only explosive scent which means they ignore the scrap metal that slows down metal detectors on their way to the landmines. As ever our hats go off to the brave individuals carrying out this dangerous work. Three new rat pups have been born via the APOPO breeding program, which is gearing up for imminent APOPO program expansion. There is a lot going on right now and because it takes around 9 months to fully train a HeroRAT, the breeding program is ramping up its activities to ensure that we are ready for future needs. Last week three new pups were born to Avatar and her mate Gamble. A rat litter is generally between two and five pups that remain with their mother for 3-5 weeks before they begin their socialization process. This begins with a week of ever-increasing periods away from their mother, to play with Uncle Albert (our resident rat socializer). After this they are fully separated from their mother and spend another week of socialization with rat trainers, before their scent detection training formally begins. This initial socialization period gets them used to working with people and ensures that they are comfortable with being handled, and that the everyday smells and hubbub of the modern environment in which they will soon work will not interfere with their subsequent training. A warm welcome to our newest Heroes! APOPO and the Ministry of Defense of the Government of Zimbabwe have officially signed a historic agreement to allow APOPO to begin clearing landmines in the country. Zimbabwe’s landmines were laid during the Liberation War of Independence (also known as The Second Chimurenga of the 1970’s) by the army of Rhodesia (as Zimbabwe was then known). The Rhodesian military created lethal barriers along the border to Mozambique to keep liberation forces at bay. These are some of the most mine-impacted areas in the world with 5,500 landmines per kilometer at some border minefields. However, other areas nearer to towns and villages are also suspected of low-level landmine contamination, and the mines effectively render vast tracts of their land off-limits. As well as the tragic accidents that inevitable occur, local communities are also unable to access basic needs such as prime farming land, paths and market routes, and expansion of residential and business areas, and sustaining a perpetual cycle of poverty. This is where the HeroRATs come in. Ignoring scrap metal and only detecting the scent of explosives, they are able to check large areas of land much faster than conventional methods such as technicians with metal detectors. This saves more lives by halting further injuries, and gets people back on their productive land as fast as possible. We recognised the need for faster TB diagnosis as paramount, which is why we are thrilled to announce APOPO’s new TB facility in Dar es Salaam, Tanzania, due to open in July 2016. In partnership with the Tanzanian Veterinary Laboratory Agency (TVLA), the facility will include a new TB center with a top-notch lab, brand new rat facilities and TB detection rooms. About 10 HeroRats will be deployed to screen samples, increasing the number screened by over 50%. Located in Dar es Salaam, the new facility will cut waiting times for the delivery of results to 12 hours. This means that TB positive patients will be treated the following day, which is not only good for the patient, but will reduce the risk of them infecting other people. We thank you for your support, without which we could not have achieved this remarkable next step! APOPO places a high value on animal welfare. As the organization is built around the rats, we ensure that they are treated like the heroes they truly are. With your support, our staff makes sure the HeroRATs are in good health and well cared for and can save many more lives! One of the aspects our rats receive is environmental enrichment through the use of toys, objects for chewing, and a clay pot in their cages. It is important that animals such as the HeroRATs receive environmental enrichment because without they will become bored, causing stress, aggression and lowered performance. All the HeroRATs are provided with enrichment items like a specifically designed clay pot that provides a dark and cool environment, wood to gnaw on, bedding to make a nest and some toys, such as little balls and boxes made of toilet paper rolls and filled up with peanuts. These toys motivate the animals to forage for food, behavior specific for the Cricetomys Gambianus. Wild African giant pouched rats make a number of foraging trips in a typical night, gathering food in their pouches and returning to their burrow to store it. Their cheek pouches help them to harvest food while out foraging and defer eating until reaching the safety of their burrow, thereby reducing exposure to predators. We're very grateful for your support that helps us treat our Heroes the way they deserve it. Our brave little HeroRATs always work alongside human colleagues, like the demining staff. APOPO's deminers in Mozambique have demonstrated tremendous commitment, sacrifice and dedication in helping rid the country of thousands of landmines and return safe land to the people of Mozambique. Now the country has successfully resolved its landmine problem, it no longer requires such a large core of deminers. For many of APOPO's staff in Mozambique, APOPO was their first formal professional experience, and due to the narrowly specialized and highly technical nature of the work, they may struggle to compete for future work opportunities without new skillsets. APOPO therefore initiated a vocational training course, allowing our former deminers to acquire new skills and undertake an alternative career. APOPO is offering a range of courses in cooperation with the Mozambican National Institute of Employment and Vocational Training (INEFP): plumbing, carpenter, small business management, accounting, agro-processing and many more. Last year 61 people enrolled and they have all recently completed their courses with positive feedback. We’re happy to announce some have already found a new job or started a small business on their own, allowing them to provide for themselves and their families. This year another 70 people will participate in the training. Thank you so much for joining us in the fight against landmines and helping us to support our deminer-Heroes build up a new life! Learn more about our work, staff and HeroRATS by visiting our website or following us on Facebook, Twitter and Instagram. The HeroRATs are on a roll! We shared the exciting news of Mozambique being officially mine-free but our HeroRATs and demining teams are still working in the country. The humanitarian demining tasks came to a close but APOPO is currently supporting the Mozambican National Institute of Demining with some residual tasks, like ammunitions clearance of a former weapons store that is being transformed into an ecological park. We have 16 HeroRATs supporting the operations at Malhazine and the task is progressing well. So far we have verified 76,647 square meters of land and safely discovered and identified 4,550 items of unexploded ordnance, 13 landmines and 140 items of small arms and ammunitions. In Cambodia the mine detection rats arriving earlier this year have almost finished their in-country training and are being tested before deployment in the minefields. All HeroRATs have successfully taken a first important hurdle before deployment in the real minefields by passing a performance test according to International Mine Action Standards (IMAS) and administered by the Cambodian Mine Action Authorities and our partner the Cambodian Mine Action Center (CMAC). They will now move on to a last stage of testing before being deployed on to the minefields and saving lives! We’re also happy to announce we’ve implemented a new strategy that will help us to get more TB patients on treatment. The TB team in Mozambique are collecting sputum samples from 14 clinics every day and the HeroRATs are now testing the samples till well into the night, allowing us to return test results to the clinics in less than 24 hours. This means that patients, who are tested as negative by the clinics, but found TB positive by APOPO, will now be told of the APOPO result before leaving the clinic. This reduces the need to track them down at their homes, and gets more people on to TB treatment immediately. We couldn’t have accomplished all this without your generous support and we would like to thank you wholeheartedly. HeroRATs helped Mozambique become mine-free! We're thrilled to announce that Mozambique was officially declared free of all known landmines on the 17th of September! This massive accomplishment wouldn't have been possible without the tremendous efforts of our brave deminers and HeroRATs and your generous support! 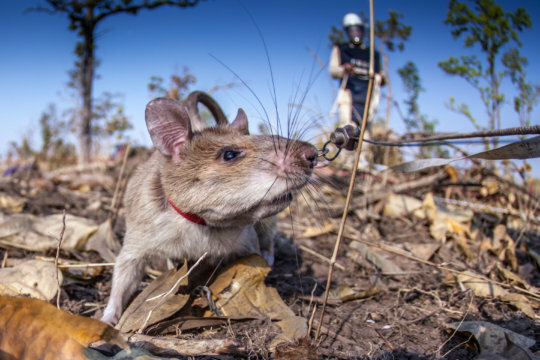 Mozambique is now freed of tens of thousands of landmines and this achievement is even more special to APOPO since Mozambique is the first country where our landmine detection rats were tested and deployed in the real minefields. Back in 2003 a first group of landmine detection rats nailed their trial tests in a densely mined field, indicating all 20 mines that were subsequently found by the manual deminers. A massive breakthrough for APOPO and the HeroRATs, proving our sniffers were up for the real job in the minefields. Soon after, eleven rats passed the accreditation test organized by the National Demining Institute of Mozambique and received their operational license. They joined our mine action team in Gaza Province where they have helped clear over 6 million square meters of land, more than a year before the deadline! This successful clearance operation was the start of many tasks throughout Mozambique and eventually the HeroRATs have helped free five provinces of landmines, thereby finding 13,274 landmines and returning 11,124,446 square meters of safe land to the people of Mozambique. "We were all excited when the rats passed the first trial and accreditation tests but I don't think anyone of us was hoping they would become such an important part of our operations and would help Mozambique become mine-free", says APOPO's training manager Abdullah, who was in Mozambique in 2003. "I'm so proud of them and I look forward to celebrating future accomplishments of our HeroRATs in Angola and Cambodia"! A special thank you from our team and HeroRATs in Mozambique and we hope we can free more countries of landmines and help thousands of people back on their land with your support! Tomorrow, Wednesday July 15th, is a big day for everyone at APOPO and a great opportunity for our GlobalGiving supporters around the world to help our HeroRATs in their life-saving missions. Your donations help our HeroRATs save more lives and if you make just one donation to APOPO this year, make it tomorrow! Tomorrow is GlobalGiving's Partner Bonus Day, where every donation to APOPO will be matched at 50%. This means that for every $10 you donate, APOPO and the HeroRATs will receive $15, making it the best day of the year to donate. The event starts at 9AM EST and lasts until Midnight. Our Tuberculosis detection rats have done an excellent job the first half of this year, detecting over 950 TB patients in Mozambique and Tanzania that were initially missed by microscopy. Thanks to our heroes, these people could start treatment and get active again without risking to infect others. We’re also very excited to inform you about the arrival of some of our mine detection rats in Cambodia, one of the most mine-contaminated countries in the world! This is the first time our HeroRATs havetravelled outside of Africa. The rats are now acclimatizing and undergoing further training before the Cambodian Mine Action Authorities will test them to make sure they are ready for the operational work. Once they pass this test the HeroRATs and their trainers are officially licensed for operational work in the minefields and can start helping people back on their land. Thank you for your generous support from everyone at APOPO and all of the HeroRATs! Angola is one of the most mine-affected regions in the world with about one fifth of the population affected by landmines and explosive remnants of war (ERW), that’s over 4 million people! “We’re committed to help those 4 million people getting their land and lives back and would like to thank you for your kind support”, says APOPO Program Manager for Mine Action in Angola, Frank Gregorio. Early 2014 APOPO received an operational permit for a humanitarian landmine clearance project in Angola. Together with its local partner Norwegian’s People Aid (NPA), APOPO carried out operations in Malange province with support of the Mine Detection Rats(MDR), clearing an area of more than 190,000m2 and helping thousands of people back onto their land. Now preparations have started to deploy the HeroRATs in Zaire Province on the border with the Democratic Republic of Congo (DRC). Our teams will be clearing two sites, Malele 2 and Malele 3, in Mbuela commune about 100 kilometres North from province capital Mbanza Congo. The area was a strategic zone during wartime, with a position of the Angolan Armed Forces (FAA) and offices of the border police and immigration. Mines were laid as a protective tactic in an area of about 240,000 m2, along the border and a road leading to the border. The now contaminated land is much needed by the local population for agricultural and commercial activities. Once cleared, part of the area will be used to develop a market that will stimulate cross-border trade with neighboring Congo, creating development opportunities and positive change in the lives and livelihoods of the local community. If you want to know more about our work, progress and future plans in Angola, please check our website, Facebook and twitter. With the help of the HeroRATs, our demining teams are now supporting the clearance of landmines in a residential area in Ngola Luije in the northern part of Angola. The site was a military camp during the war but when the soldiers left, landmines and other explosive remnants of war remained and are now acting as a barrier to development as well as a dangerous hazard to local communities. Clearing the mines will also allow the community to use the much needed land for agricultural and developmental purposes. Most people living in the area are small scale farmers, depending on arable land for their livelihoods. From APOPO and all the school children, teachers and parents, thank you for helping us make Ngola Luije save to live, play and farm. APOPO and the HeroRATs want to thank you for your support the past year and wish you all the best in 2015! Thanks to you and others like you, we can look back on a very successful year: we were able to send rat-reinforcements to our team in Angola, we’ve expanded the reach of our Mine Action program into Cambodia with the launch of projects in some of the most mine-affected areas and our staff and the HeroRATs in Mozambique are proud to have been part of the clearance of two provinces that are now declared mine free. Overall, we have found over 21,000 landmines and bombs and cleared/released over 8.2 million square meters of contaminated land, allowing local communities to get back to using their land and carry on their lives without fear. Our tuberculosis detection rats have sniffed out more than 50,000 sputum samples, collected from clinics in Tanzania and Mozambique, thereby helping us to diagnose over 1800 patients who were missed by conventional methods. We expanded our collaboration from 8 to a total of 15 health centers in Maputo, allowing us to collect almost 100% of all the samples produced in the city. Thanks to your generosity and the help of the GlobalGiving community, we were able to train and deploy more HeroRATs, helping us to free thousands of people from the threat of landmines and tuberculosis. We would like to take this moment to thank you for your kind support and we look forward to sharing more of our successes in 2015! Mozambique is on track to be free of landmines by the end of this year. Abu is one of APOPO’s deminers who’s been working hard towards this achievement. Every day he makes sure his family and community can live, work and play in their fields without fear. “Everyone in the community knows about the mines that put our lives in danger. I decided to do something about it so I joined APOPO”, says Abu. “I carry out tasks such as minefield preparation and landmine detection. Once our HeroRATs have found the mines, I carefully expose them and my colleagues then safely destroy them. The rats are truly amazing. They are so fast! They can search 200 square meters an hour. This could take me eight days. People say I risk my life to find the landmines. But we follow strict safety rules and we take regular breaks from the heat and intense concentration. There are also fully trained medical staff on hand with top quality equipment. My job supports my family and I help to pay school fees for my nieces and nephews. I also started up my wife in our business as one day all the mines will be gone. And my children can now play and collect firewood without fear of landmines. Thanks to apopo, my family is now safe”. The Maputo 3rd Review Conference of the Mine Ban Treaty concluded in late June in positive fashion with the seventy-nine participating state parties making strong declarations of renewed commitment to the Treaty. The convention was convened to discuss the progress made toward realizing Treaty commitments in countries suffering from landmine and ERW contamination. Specifically, individual deadline requirements and extension requests were considered as states parties work to clear their territories of landmines and destroy stockpiles in accordance with set deadlines. Although much progress has been made there is much left to do in spite of commitments shown. The review conference offered a high-level space for inclusion of landmine survivors and considered the plight of landmine victims, who long after landmine clearance has taken place still find themselves unable to work or without proper support. Apopo’s honorary president HRH Princess Astrid of Belgium addressing the conference said "...victims should be integrated into global and national policy related to disability, health, education,employment, development and poverty reduction." The International Campaign to Ban Landmines (ICBL) also issued a completion challenge to all states parties, asking them to commit to complete all major Treaty obligations within the next decade. "The Maputo Action Plan adopted today provides a roadmap for what needs to happen during the next five years to achieve a world without landmines," said ICBL-CMC Executive Director, Sylvie Brigot-Vilain. The ICBL reacted with guarded optimism to the United States' long awaited announcement that it intends to take steps to join the Treaty. Although the ICBL pointed out that no target date has been set by the US, they acknowledged that the announcement shows that the US has changed its stance on the Treaty for the better. Apopo was well represented at the Conference, including at the welcome reception on Sunday evening where eight apopo deminers were in attendance. Apopo was honored by the invitation from the Director of Mozambique’s National Institute for Demining (IND), Mr. Alberto Augusto, because deminers are the backbone of apopo operations and must not become forgotten heroes. Apopo has much to show for its efforts in Mozambique and beyond since 2007, having released over 11 million square meters of land back to local populations with over 900,000 people having been freed from the threat of landmines. Country Director for apopo Mozambique Mine Action program Tess Tewelde said "the occasion of the Convention was a welcomed opportunity for Mozambique to present its remarkable progress in mitigating its landmine problem. For its part apopo was proud to showcase our work in strong partnership with the IND, national and international stakeholders. Apopo sincerely thanks its donors and partners who make this life-saving work possible." The HeroRATs have found over 5,500 TB-positive patients originally misdiagnosed by local hospitals in Tanzania and Mozambique. Here is one of one their stories, William M.
"I am William. I contracted TB but it was not diagnosed until tested by Apopo HeroRATs. I work hard at a dairy to pay for my kids' school fees. I have an elderly father and 8 children to look after. If I am sick, I can't work. After 3 visits to the clinic without diagnosis, I became sick, thin and very worried. My workmates became worried of co-infection because we work so closely together. Many of my friends have died from TB, it's devastating." "Then the clinic called to say that I had been tested TB positive by rats. Rats! We can hardly believe it. If the HeroRATs had not diagnosed my TB, I think I would be dead by now." William's wife Esther says "I am very relieved that the Apopo rats found William's TB. Now he is on the mend." From William and everyone at APOPO, thank you to all the GlobalGiving supporters we have made thousands of stories like this come true! APOPO is about to complete training and testing of 10 mine detection rats (MDR) in our training and research facility in Tanzania in preparation to deploy to Cambodia and begin operations. This is the first time that our MDR have been deployed on survey and clearance operations outside of Africa. APOPO plans to recruit and train Cambodian handlers to team up with the 10 MDR by mid-year so that MDR survey and clearance operations may then commence. Late last year, APOPO signed a memorandum of understanding with the Ministry of Foreign Affairs and International Cooperation of the Royal Government of Cambodia, to advance the shared goal of freeing Cambodia from the threat of landmines, under the authority of the CMAA. Cambodia is afflicted with mines and explosive remnants of war left behind by 30 years of conflict that ended in the 1990’s. A recent survey revealed that 1,915 Km² throughout the country is still suspected of mine contamination. While the number of landmine related casualties has been drastically reduced from 4,320 in 1996 to 186 in 2012, landmine contamination continues to hinder national reconstruction and development. Cambodia’s landmine and ERW problem is huge and too complex for the country to burden alone. International support and assistance will be required for many years to come until the country is able to cope with the problem. Happy New Year from the HeroRATs! As a donor to APOPO and GlobalGiving, we want to thank you for your support and wish you a very Happy New Year and all the best wishes in 2014! A quick program update on APOPO’s performance: the HeroRATs and their human colleagues continue to work hard everyday, clearing over 8 million square meters of land in Mozambique, destroying over 2,700 landmines, and detecting over 4,700 TB patients misdiagnosed by local hospitals in Tanzania and Mozambique. We are going to Cambodia! In late November, APOPO signed an agreement with the Ministry of Foreign Affairs and International Cooperation of Cambodia to clear landmines in Cambodia, and the HeroRATs are going to be part of this! APOPO and the HeroRATs are proud to have recently launched myapopo.org! Under the direct supervision of the HeroRATs, the APOPO humans have been working hard to improve the donor experience to be a lot more fun! At myapopo.org, donors can adopt a baby HeroRAT that they can name themselves. Then guide its growth, development, and choose whether it detects landmines or tuberculosis patients. The many benefits of adopting include: an adoption certificate, frequent updates on your personalized myapopo wall, fun and interesting stories, nice pictures, fun avatars and badges, social media sharing, and seeing your HeroRAT's impact after graduation. As a current or former donor through GlobalGiving, you are entitled to the benefits on www.myapopo.org. If you wish be part of the fun experience, send an email to herorats@apopo.org. Asante Sana (Thank you) from the HeroRATs! ASANTE SANA (Swahili for: thank you very much)! As the year draws to a close, the APOPO HeroRATs and humans hope that you had a peaceful, healthy and happy 2013. Because of the support and generosity of our friends around the world, APOPO and the HeroRATs can look back on the past year thus far as an amazing one with significant achievements and several milestones. 2013 saw dozens of HeroRATs trained and sent to start work detecting landmines in Angola and Mozambique as well as trained to detect TB in Tanzania and Mozambique. We passed the 4,500 mark for total TB patients detected meanwhile clearing over 8 million square meters of land in Mozamique throughout the years. The GlobalGiving community is a huge part of this success as you have helped us raise almost $300,000 over the years! So we would like to take this moment to thank you for believing in us in 2013, and for giving us something to celebrate. We look forward to sharing more life-saving adventures with you in 2014. Best wishes to you during the upcoming holiday season! Last week 26 Mine Detection Rats (MDR’s) were deployed to Mozambique. These rats will go through a period of acclimatization and training in order to pass an official external accreditation test according to International Mine Action Standards (IMAS). Once passed the rats and their trainers will be officially licensed for operational work and can begin to work with their HeroRAT comrades in the minefields. So far, a total of 2,546 landmines have been found and neutralized, and a total of 7,850,234m2 of land returned to the population, safe to be used for agriculture and grazing. The 19th International Union Against Tuberculosis and Lung Disease Conference was held in Kigali, Rwanda on the 20 - 22 of June, 2013. Dr. Negussie Beyene, APOPO’s Program Manager for the TB program made an oral presentation about rat TB detection and working with local NGO’s to track down TB sufferers diagnosed by the rats after having being missed by the microscopy labs. In order to track these patients APOPO partners with one Tanzanian NGO MKUTA, composed of former TB patients and has managed to establish yet another partnership with PASADA who target HIV sufferers for TB testing by the rats. His Excellency Ambassador Rolf Schulze and APOPO Program Manager for Thailand Kim Warren, recently signed an agreement granting 281,550 EURO from Germany to support APOPO’s efforts to improve security in mine affected communities in Thailand. "German foreign policy traditionally attaches great importance to humanitarian demining worldwide”, said the ambassador. " I am happy to continue our successful cooperation with APOPO and its partners, the Thai Mine Action Committee and Peace Roads Organization. It is a modest contribution to making people's lives safer and return land to the use of local communities along the border." Germany, has been supporting APOPO in Thailand since 2012 along with Liechtenstein, Germany and Stichting Doen. On Sunday 18th August, long-term APOPO and HeroRAT supporter Ethan Herschenfeld competed in the Mont Tremblant Ironman contest in Canada for which he’s been training like mad, closely watched by APOPO. Here’s his story: “The day began at 5 a.m. with the walk from my hotel to the start line where it turned out I was the only athlete of around 3,000 competitors not wearing a wetsuit. I’m accustomed to outdoor swimming from my dips in the Hudson with New York City swim (NYC Swim). That, along with the word ‘APOPO’ which I’d scrawled all over my body, got a lot of attention before I even jumped into the water and the voice of Mike Reilly, the official ‘Voice of the Ironman’ screamed out over the loudspeaker: "Hey! There's one guy without a wetsuit!! What does it say on his chest? APOPO?"... Read more about Ironman Ethan's Big Day here. The first APOPO TB research lab was established in Morogoro, Tanzania in 2005, and since 2008, the HeroRATs have delivered very promising results, with a reported increase of 43% in the tuberculosis detection rates in the samples evaluated. There are now a total of 17 collaborating clinics in Dar es Salaam, 182,742 sputum samples screened since 2007, and 3,862 additional TB patients identified by rats. With the aim of replicating the results obtained in Tanzania, APOPO opened its operations in the Republic of Mozambique earlier this year, thus contributing to the Ministry of Health efforts to control tuberculosis in the country. A laboratory opening was held on June 28th, 2013 and APOPO will now evaluate the samples coming from patients with suspected tuberculosis. The host was University Eduardo Mondlane, with the University’s Chancellor presiding over the ceremony. In Mozambique, APOPO recently carried out a manual deminer training session for 26 trainees. In order to support local employment, candidates of trainings are recruited from communities where APOPO is working. All candidates scored well enough to be hired by APOPO. Read more about our mine action activities. The first APOPO TB research laboratory was established in Morogoro, Tanzania in 2005. Since 2008, the HeroRATs have delivered promising results, with a reported increase of 43% in the tuberculosis detection rates in the samples evaluated. There are now a total of 17 collaborating clinics in Dar es Salaam, 178,425 sputum samples screened since 2007, and 3,788 TB positives identified by rats after being missed by microscopy. With the aim of replicating the results obtained in Tanzania, APOPO opened its operations in the Republic of Mozambique earlier this year, thus contributing to the Ministry of Health efforts to control tuberculosis in the country. To conduct the research, a laboratory was built at Eduardo Mondlane University’s Veterinary School grounds and opened on June 28th, 2013. APOPO rats will evaluate the samples coming from patients with suspected tuberculosis, and any positives will be confirmed using fluorescence microscopy techniques. So far, there are 8 participating units in Maputo, and a total of 7,210 sputum samples screened since January. In regards to APOPO mine action, last week 26 Mine Detection Rats (MDR’s) were deployed to Mozambique. These rats will go through a period of acclimatization and training in order to pass an official external accreditation test according to International Mine Action Standards (IMAS). Once accredited, the rats and their trainers will be officially licensed for operational work and can begin to work with their HeroRAT colleagues in the minefields. So far, a total of 2,406 landmines have been found and neutralized. A total of 6,423,361m2 of land has been returned to the population, safe to be used for agriculture and grazing. Thailand offers its hospitality to millions of tourists every year and has become one of the biggest and most attractive tourist destinations in the world, charming its visitors with a rich array of history, culture, architecture and food. Yet few are aware of a considerable mine problem along the borders, especially with Cambodia, and that people living in these areas suffer from landmine accidents, fear of accidents and limited access to arable land. APOPO has built upon the excellent start in Thailand in 2011 where it implemented a Non-Technical Survey (NTS) program along the Thailand-Cambodia border. APOPO has partnered with a local Thai NGO, Peace Roads Organisation (PRO) and has been working closely with the Thailand Mine Action Centre (TMAC) to systematically survey all minefields along the border in Trat & Buriram Provinces. NTS gathers detailed information about mined areas including the number of mines, location and size. The consequence of this NTS process is that considerable time, effort and money will now not be wasted clearing land unnecessarily. This then increases the efficiency and effectiveness for the mine action programs and will assist Thailand meet its mine ban treaty obligations. I once met a four-year-old boy while visiting a physical rehabilitation centre in Colombia. He sat on a small chair in front of a small table. A woman, probably his mother, accompanied him. A physiotherapist sat on the other side of the table. She was holding some cards in front of him, and it looked like they were playing a game. I could not be further off. The boy tried to manoeuvre his hand to grip the cards, but his hand had been replaced with a prosthesis. Low-cost mine identification and removal tools are also needed to maximize available resources. APOPO, for example, works with rats to aid this process. Rats are a very efficient tool for releasing large mine suspected areas and can help free areas from the threat of landmines efficiently and at very low costs. Our ultimate goal is to reach the zero new landmine victims goal in the countries where we work. It’s a hairy goal but we cannot aim for any less. Read the original article on The Humanitas Global Development Blog. 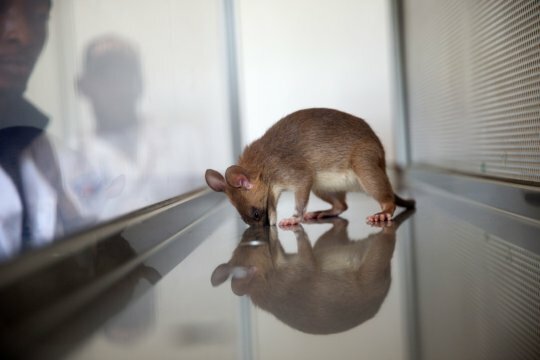 Tuberculosis detection operations by trained sniffer rats began in Maputo, Mozambique in early 2013. For the first phase of operations, eight HeroRATs will analyze over 560 samples of human sputum per week. The Mozambican staff and equipment are ready for the exciting start of APOPO’s new arm of TB operations. Local staff from the country’s capital city of Maputo, have started working with the animals. The staff were trained at APOPO’s TB headquarters and research facility in Morogoro, Tanzania, by a team of senior lab technicians and animal handlers, before they were sent to work in the Maputo facility. APOPO has partnered with eight local health centers in Mozambique which will provide the samples. The rats will then serve as second line screening for the centers, which check for TB under a microscope. This is APOPO’s second location for TB operations and marks the first international expansion of the TB Program. Mozambique has a very high burden TB and co-infection, where a patient has both TB and HIV. It is often difficult to diagnose TB in HIV patients, and TB is a leading cause of death for people infected with HIV. APOPO Mozambique TB Program Manager Emilio Valverde, “Mozambique withstands a terribly high burden of TB. This is particularly serious in HIV patients, accounting for a 16% of the Mozambican population. My personal hope is that APOPO rats can contribute to alleviate this burden in a short term." For a country affected by remnants of a war that lasted 30 years, it had initially seemed like an uphill task to render Mozambique completely mine-free by 2014 according to the Mine Ban Treaty deadline. Now the clearance of the Gaza region has demonstrated that strong and collaborative efforts can indeed beget transformative and impactful results. APOPO's strategic Gaza mine action program which started in 2008 has cleared over 6 million square meters of land in the province with a budget of just 5.5 million Euro. In its clearance efforts, the APOPO mine action team has found 2,393 landmines, 12,838 small arms and ammunition and 922 UXO. Demining efforts in the last decade focused in the grossly-affected northern regions of Mozambique and several southern provinces such as Gaza fell through the cracks. Landmines posed a threat not only to the lives and safety of the people but also kept any development firmly away because of the ever-present danger of destruction. As the existing team of Mine Detection Rats continues to achieve bigger milestones in Mozambique, APOPO has sent an additional group of 15 HeroRATs to strengthen its Mine Action projects in the country. In Chokwe, where our landmine operations are based, the new rats are exploring the environment and getting familiar with their new trainers. These HeroRATs are now undergoing their formal training and preparation for accreditation by the National Institute of Demining. They will practice sniffing for buried mines in the field early every morning for about a month. Once they train hard and pass the accreditation exam, the HeroRATs will immediately start operation in a live minefield. APOPO's Mine Action Program in Mozambique also has a brand new all-ladies demining team recruited to contribute to equal opportunity and employment in the area. This highly motivated team wholly comprises of women hired from the local communities and all without prior demining experience. APOPO's ladies team has already started operations, removing hand grenades and POMZ mines from the Chokwe minefield in Southern Mozambique. APOPO has partnered with Norwegian Peoples Aid (NPA) in Angola to provide 40 Mine Detection Rats (MDR) to support their mechanical flails in the Malanje Province. The APOPO MDR will significantly increase productivity of these machines and speed up the release of land back to the local communities. The Belgian Government has provided funding for the next three years, and we have recruited an Angolan Project Manager as well as an Operations Coordinator to manage this project. In addition to this APOPO will also recruit and train 10 Angolan female MDR handlers. The 40 MDR for Angola are undergoing final training and testing in Morogoro and it is hoped to move them to Angola by September. “This partnership with NPA in Angola is a remarkable opportunity for both organizations to combine their individual strengths to benefit the mine affected communities of a country synonymous with landmines.” TeKimiti Gilbert, Head of APOPO Mine Action. Thank You: What you helped us achieve in 2011! As the new year begins, we hope that you had a peaceful, healthy and happy 2011. Because of the support and generosity of our friends around the world, APOPO and the HeroRATs can look back on the past year as one of our best years yet! CLICK HERE to view the special video message we created to thank you for what you helped us to achieve in 2011. Thanks to you and others like you, the HeroRATs have sniffed out over 700 landmines and returned more than 710,000 square meters of land back to the people of Mozambique. We’ve expanded the reach of APOPO Mine Action into South East Asia, with the launch of our combined Technical and Non-Technical Survey along the Thai-Cambodian border. And we rats are proving ourselves as a vital new diagnostic tool, every week increasing new TB case findings in Tanzania. We even intend to replicate the success of this program in Mozambique in 2012! Of course, none of this would have been possible without the generosity and help of the GlobalGiving community. Your support has given many a HeroRAT the opportunity to relax in a shiny new kennel after a morning’s training session. It’s bought the plane ticket to Mozambique for Mine Detection Rats, ready to put their life-saving training to work in the minefields. And, of course, it’s thanks to your support that the HeroRATs’ cheeks are often full of our favorite rewards: sweet bananas and peanut treats! So we would like to take this moment to thank you for believing in us in 2011, and for giving us something to celebrate. We look forward to sharing more life-saving adventures with you in 2012. 2,500 lives changed and counting. That’s the number of lives that have been changed since starting our unique Tuberculosis Detection Program in Tanzania. Thanks to our detection rats, 2,500 patients have been correctly diagnosed with Tuberculosis – after wrongly been told they were healthy – and are now able to begin life-saving treatment. APOPO has begun preparations to replicate these results in Mozambique. We’re training HeroRATs in Tanzania to be sent to Maputo, Mozambique’s capital, in four months time. But before they can get to work, we need your help. Foundations must be laid, plumbing must be installed, roofing must be built, and electricity must be switched on before our rats can welcome themselves home in a brand-new, state-of-the-art TB Detection Facility. With your help, we can build this together. Once that happens, we can start saving lives. On Mother’s Day, give your mom a unique gift by helping mothers around the world. Lurdes Macheque is a young woman and mother living in Cuarenta, a small village in the Gaza Province of Mozambique. Cuarenta is located in one of Mozambique’s most heavily-mined areas, and Lurdes has lived nearly her entire life in fear of landmines. But thanks to landmine clearance in the Gaza Province, the lives of families in Cuarenta have already changed for the better. Villagers walk freely on cleared land, and mothers like Lurdes can let their children play without fear. Help us make more moms smile: donate your Mother's Day gift to support APOPO's mine clearance work in Mozambique. Help us build a TB Detection Clinic in Mozambique! In October 2011, APOPO was awarded a grant by the Flemish Government to expand our Tuberculosis Detection Program into Mozambique – a country with an extremely high incidence of TB, with an estimated 431 cases per 100,000 people. APOPO’s team has been working hard in Mozambique’s capital city of Maputo to establish partnerships, meet with stakeholders and set up operations, and are committed to moving forward by beginning construction on a brand-new Tuberculosis Detection Facility. The plan is estimated to come at a cost between the range of $50,000 - $60,000, and APOPO is asking our generous supporters to help us build! Your contribution will help provide inhabitants of Maputo with an accurate diagnosis, which will enable them to begin their life-saving treatment – and bring us one step closer to ridding the entire world of Tuberculosis. Help us build our TB Detection clinic today, right here on GlobalGiving! APOPO's Mozambique Program Manager, Tesfazghi Tewelde, was invited by Mozambique’s National Institute of Demining (IND) to provide training in "Land Release and Operational Quality Management" to IND operational staff. In total, 24 demining supervisors and staff from around the country participated in the training. With the key objective of reinforcing IND staff’s knowledge and capacity, the agenda of the training covered Land Release strategies, clearance strategy and methodology, quality management, and participant evaluation through both practical and theory tests. The training demonstrated APOPO’s national capacity-building initiative, and strengthened the existing cooperation between APOPO the IND. APOPO began a Mine Action Program in Mozambique in 2006, and in 2008 was tasked as the sole demining operator for Mozambique’s Gaza Province. So far, APOPO has returned 4,282,359 square meters of land to the population in the region through a combination of clearance and survey methods. APOPO is pleased to announce that we have welcomed a new Head of Mine Action to our team. TeKimiti Gilbert comes to APOPO with a long and successful career in demining behind him, having held senior operational positions in Mine Action programs within the United Nations. TeKimiti graduated from l’Institut Européen de Genève with a Master of Advanced Studies in International Security and is a graduate of the Geneva Centre for Security Policy, International Training Course. In addition to these credentials, TeKimiti brings extensive practical experience implementing the clearance of landmine and explosive remnants of war contamination throughout the world. Thanks for your support of APOPO and the HeroRATs! April 4th marks International Day for Mine Awareness, and APOPO remains dedicated to our mission of seeing a mine-free world. In 2011, APOPO’s Mozambique Mine Action team found and destroyed 792 landmines, 227 Explosive Remnants of War, 2,683 Small Arms and Ammunition, and released 2,632,608 m² of land in the Gaza Province. But our work in Mozambique goes beyond these numbers. It is defined by our most valuable asset: the people who make up our incredible team. Usseni Ussi, an inhabitant of Gaza, knows what it is like to live in fear of the explosive remnants of war that lie hidden in the earth. “During the time I grew up, there was no demining activity at all. No one could use our land. We could not even walk freely. And the community was very static as a result. There was no growth,” he recalls. In 2006, Ussi heard about APOPO’s demining work on the radio. When APOPO arrived in Gaza he went to the camp to see the rats he had heard about, and found employment with APOPO’s Mine Detection Rat team. On International Day for Mine Awareness, help us see a world free of mines. Internationally renowned primatologist and conservationist Dr. Jane Goodall recently spent a morning with the APOPO team – human and rat alike – as part of her larger visit to Sokoine University of Agriculture this February. After being introduced to our work through our founder, Bart Weetjens, Dr. Goodall visited our Tanzanian headquarters for the first time in 2003. This month she was warmly welcomed back to our training facilities, where she spent a morning touring APOPO’s landmine detection training field, viewing the rats in action, and speaking with our HeroRAT trainers and staff. Following a break at APOPO’s Tuberculosis Detection facility for tea and coffee, Dr. Goodall, along with her team, representatives from Sokoine University, and members of the University's Roots and Shoots club, commenced the planting of 20 fruit trees to brighten the garden of our TB Detection facility. “I admire the work APOPO is doing with their HeroRATs, on behalf of the thousands of people whose lives have been saved, and for changing the reputation of the rats for the better,” said Dr. Goodall, after completing her visit of APOPO. The entire APOPO staff was proud to present our training headquarters to Dr. Goodall and her team, and we invite her again to Morogoro anytime! Azarias is one of many people affected by landmines in Mozambique. In 1981, he lost his right leg after stepping on a landmine in the Pfukwe Corridor of the Mabalane District. Since then he has lost his brother, uncle and cousin, all to landmines. His livelihood, livestock, was also at risk. APOPO has since been clearing mines in the Mabalane District, which was one of the largest minefields in Mozambique. APOPO’s Mine Action Program in the Gaza Province has so far positively affected the lives of over 117,500 people. • 70% SHA or Area With Restriction (ARW), pending further technical survey. Alongside the four non-technical survey (NTS) teams, APOPO-PRO had two small technical survey (TS) teams, whose role was to verify information being collected. Through this verification process, 476 mines were found along with 876 explosive remnants of war (ERW). These finds confirm that the NTS methodology is correctly identifying areas containing mines. With such a promising start for the survey program, APOPO hopes to secure further funding to ensure that we continue to play a significant role in helping the Thailand Mine Action Center (TMAC) achieve their goal of a mine-free nation. HeroRATs put their best paws forward for the camera in their latest cinematic effort, “A Day in the Life of a HeroRAT-in-training,” specially filmed for GlobalGiving’s 2012 Video Contest. Even though the HeroRATs were not declared winners this time around, the three-minute video remains featured on our GlobalGiving project page, Train HeroRATs for life-saving detection missions. The video follows a typical morning in the lives of future landmine detection HeroRATs, as they train hard inTanzania to fulfill their dreams of one day saving lives in Mozambique or another mine-affected country. All GlobalGiving Video Contest entrants were judged by Laura Knudson, Education Program Manager for the Green Living Project, a film production company that documents global stories of sustainability. Although the HeroRATs were not chosen among the final five, the rats are still proud of their effort and invite you to view the video: either right here on GlobalGiving, or here on APOPO’s Youtube Channel. Stay tuned for more films in the future as the HeroRATs shake, rattle, and roll for the camera! Help us improve our communications by taking our survey! APOPO ranks 24 in Global Top 100 Best NGOs list! This month, The Global Journal published its inaugural “Top 100 Best NGOs” list, the first international ranking of its kind. An initial group of 2,000 non-governmental organizations was researched, edited, and eventually cut to 400, before the final group of 100 was selected – and APOPO came in at No. 24! The Global Journal is a print and online publication based in Geneva and New York that covers the issues and players shaping global governance today. All organizations considered for the Top 100 were assessed based on five key criteria in relation to their humanitarian efforts: impact, innovation, transparency, sustainability and efficiency. APOPO is excited to have made the list, among an incredible group of worthy organizations. With this validation, we will continue to strengthen our impact and further our efforts to provide solutions to global humanitarian detection challenges. You can take a look at the full list of Top 100 Best NGOs here. For creatures that live and work so close the ground, the HeroRATs definitely finished their year on a high note with the news that we had been declared Second Winner in McKinsey’s Social Innovation Video Contest! Thanks to the tireless voting and promoting of our friends and fans (that means you! ), the good news came as an early holiday gift to APOPO’s HeroRATs, when the contest winners were announced on December 13th, 2011. Our video entry, “Training HeroRATs to sniff out TB,” received 709 votes throughout the ten-day voting period and placed us Second out of 11 Finalists. We were honored to be included with First Winner, “Embrace,” and Third Winner, “The sOccket,” whose videos (along with the Fan Favorite Winner submitted by “Duto:IRIS”) can be watched here. The top three winners will be included in a print edition of McKinsey’s publication What Matters (out this month! ), will be featured in a special TV program co-produced by Link TV and Viewchange.org, and will be honored at a networking reception in New York City. Winners have also already been featured on the Huffington Post’s Impact Blog! We’d like to send our gRATitude to everyone who voted for our video in the contest. Thanks for your support! In December, APOPO held a successful TB workshop at our headquarters in Tanzania. Representatives of the National Tuberculosis and Leprosy Program (NTLP) were invited to take a behind-the-scenes look at our TB Detection Rats, in order to better understand the processes and importance of our collaborative efforts to increase the rate of new case findings in Tanzania. There were 27 in attendance, including Regional TB and Leprosy Coordinators (RTLCs), District TB and Leprosy Coordinators (DTLCs), and lab technicians from collaborating DOTS Centers. Professor Kazwala, from Sokoine University of Agriculture, was also present, along with members of APOPO’s TB Detection team. The workshop started with a demonstration of the TB Detection HeroRATs, followed by a video clip explaining how detection rats technology works as a diagnostic tool. The 2011 data was then presented, showing the total number of samples screened by rats during second-line screening, the total number of patients screened, and the additional cases identified by rats, from each of the DOTS centers APOPO partners with. The floor was then opened for discussion. A newly developed reporting system was adopted, which is designed to assist the DOTS Centers in calling back patients with new cases identified by the rats. A consensus was reached for all involved to continue working closely to ensure diligent patient follow up. With the new system in place, it is hoped that the NTLP will gather strong evidence that highlights APOPO's contribution to the TB control effort in Tanzania. Extra, extra! The HeroRATs found their way onto newsstands in Germany on the first day of the new year, when popular women’s magazine Brigitte published an ode to our heroes in their opening issue of 2012. Beginning with the encouragement to “Forget everything you know about rats. One day they will save the world,” the article paid homage to the human-and-rat-team of APOPO through its detailed description of our work, and by spreading the word about our furry heroes throughout the country. Its publication resulted in new adoptions and donations from over 130 German supporters, all of whom referenced the article as how they heard about APOPO – now that’s some influential liteRATure! The HeroRATs thoroughly enjoyed their moment in the journalistic spotlight of writer Claudia Münster (an adopter of HeroRAT, Tyson!) and under the flashing lights of photographer Ulla Lohmann. We would like to send many squeaks of thanks their way – and of course, to the adopters and donors who took an interest in our work after reading the magazine. If you haven’t had a chance to catch the article yet, be sure to download a PDF of it here. From November 28 to December 2, the 11th Meeting of States Parties to the Mine Ban Treaty convened in Phnom Penh, Cambodia. The annual meeting – also known as the MSP – not only includes the 159 States Parties, but also representatives from States Not Party, civilians, landmine survivors, and delegations of experts from organizations such as the International Campaign to Ban Landmines (ICBL). In attendance were Håvard Bach, APOPO’s Head of Mine Action, and Andrew Sully, Program Manager for APOPO’s Thailand Mine Action Program. Attendees were greeted with a keynote address by Song Kosal, a Cambodian ICBL Youth Ambassador and landmine survivor. Her address implored attendees to follow the theme of this year’s meeting and “Push For Progress” by accelerating mine clearance, sustaining funding and cooperation, destroying existing stockpiles of landmines, and ensuring the rights of survivors, among many other crucial goals. Cambodia’s well-known struggle with landmines – deadly reminders of past civil war – causes many to feel that, as Ms. Kosal stated, “the heart of the mine ban movement is in Cambodia.” Bringing the 11MSP to Phnom Penh allowed visitors to take note of the progress that has been made, but also to take stock of the remaining work to be done in a country that lives daily with landmines. In 2010, APOPO found our way to the region when we launched our Thailand Mine Action program with the help of a grant from the Lien Foundation. The team is currently at work in the Thai province of Trat, surveying land along the Cambodian border. To learn more about our work in the Southeast Asia, visit our Thailand Mine Action page. The mission of German NGO Kriegskindernothilfe (KKNH) is to provide emergency aid for child victims of war, and for many years, the organization has supported Elvis, a young landmine survivor from Sarajevo. KKNH have paid for Elvis’ operations, financed his new prostheses, and supported his social and professional development. Now, in a fitting and heartfelt gesture, the team of KKNH has connected with APOPO to fund the full training program of one landmine detection HeroRAT, named – you guessed it – Elvis! In doing so, they endeavor to provide support not only for victims of war, but also for preventative measures which aim to reduce the landmine impact in other affected regions. APOPO is grateful to Kurt, Luise, Elvis & the KKNH organization for their important advocacy work, raising awareness and support for landmine survivors. We have no doubt the young trainee rat, Elvis, will carry his name with pride as he goes about his daily detection missions, sniffing out mines and preventing the loss of lives and limbs. Elvis shared his story and his thoughts on his HeroRAT namesake with APOPO! If you would like to read it in his own words, please click here. The HeroRATs thank you for your interest in our work, and wish you a prosperous start to 2012! This year was filled with milestones for our Mozambique Mine Action Program. Thanks to the intrepid work of the team, which now boasts 44 accredited Mine Detection Rats, a grand total of 748,488 square meters of land was cleared in the Gaza Province of Mozambique. While clearing that land, 787 mines were found and destroyed, along with 220 items of unexploded ordnance and 2,683 small arms and ammunition. The payoff of this dedication is great: APOPO plans to finish demining of the Gaza Province, which is the most heavily mined province in Mozambique, by early next year – a full two years ahead of the 2014 deadline! The Mozambique Mine Action Program also saw a changeover in management this year. We bid farewell to three-year Program Manager Andrew Sully as he moved to Southeast Asia to pick up the reins of our Thailand Mine Action Program, and welcomed new Program Manager, Tess Tewelde, who came to APOPO from the Geneva International Center for Humanitarian Demining (GICHD). So what’s next for our resolute team? Once clearance of the Gaza Province is completed in early 2012, the team has been tasked to clear two southern districts of the nearby Manica Province, bringing Mozambique another step closer to being mine-free at last. Our Thailand Mine Action Program headed into the field for the first time in 2011. Equipped with 25 staff and a partnership with the Thai NGO Peace Road Organization (PRO), the team launched a combined Technical and Non-Technical Survey of all Suspected Hazardous Areas in the province of Trat in June. APOPO-PRO’s tactic of Land Release Methodology is proving essential in accelerating the daunting task of demining the Thai-Cambodian border. Since the start of the survey, the team has been able to confirm that 25% of surveyed land can indeed be re-classified as Confirmed Hazardous Areas, while 75% of the land can be classified as either Canceled Land or Area with Restriction. During the course of the surveys, the Thailand Mine Action Program has found and destroyed 393 landmines and 859 items of unexploded ordnance. These early results already prove that APOPO-PRO’s aid will be instrumental in bringing an end to Thailand’s deadly landmine problem. In 2012, the team plans to continue their survey in the province of Chantaburi. The longer-term vision is to utilize a team of trained Mine Detection Rats to speed up clearance efforts in the region and further the reach of our program’s impact. Significant funding is required to sustain this vital undertaking, and APOPO is appealing to anyone who might be able to support this effort to connect with us directly at apopo@apopo.org to further discuss the possibility of collaboration. Our Tuberculosis (TB) Detection Program, based at our headquarters in Morogoro, Tanzania, served as a second-line screen for more than 10,000 patients who had already been tested for TB via microscopy. Thirty-two trained TB-Detection HeroRATs screened more than 20,000 sputum samples provided by these patients, and detected over 300 new cases of Tuberculosis that had been previously missed in hospitals. While the detection rats were sniffing and saving lives, their human colleagues were hard at work increasing the capacity and recognition of the program. Our 2010 results were published this year in the Pan-African Medical Journal, and our TB Detection Center started working with the newly developed automated line cage to enhance the HeroRAT training process. New hospital partnerships were also established, with APOPO’s technicians now gathering patient samples from a total of 11 DOTS Centers. In addition, as part of our ongoing research and development, studies are being conducted to directly compare the rats’ evaluations of samples with the results of fluorescent microscopy (FMs) and the state-of-the-art Cepheid GeneXpert. The hard work and remarkable results produced by our TB Detection Program in Tanzania has resulted in a huge victory for HeroRATs as a diagnostic method. In October, the Flemish government approved a grant of 590,000 Euros for APOPO to replicate our TB detection successes in Mozambique, another high-burden TB country. The first phase of the project is already underway, and APOPO will spend early 2012 establishing an operational TB capacity in Maputo, Mozambique. This year, our HeroRAT Headquarters in Morogoro, Tanzania, continued transforming ordinary African giant pouched rats into extraordinary mine-detecting and TB-sniffing heroes. As of the end of 2011, we currently have 223 rats in various stages of landmine detection training and accreditation. In June, 20 graduRATs of our HeroRAT training course flew to the minefields of Mozambique to fulfill their destinies as life-saving Mine Detection Rats. Staff and rats in our Remote Scent Tracing Program have been lending their minds, noses, and energy to detecting and discriminating new scents, such as salmonella bacteria, illegal tobacco, and bedbugs. In addition, preliminary research into the CameRAT application was conducted. This project currently involves training six young rats to search for humans and to respond to a command to return to the site where they were released. Some of these initial research programs may result in operational applications in future, provided the necessary support is secured. Meanwhile, nestled in their comfortable burrows deep inside our breeding kennels, still other HeroRATs have been hard at work with the rewarding (but tiring!) task of contributing to the next generation of heroes. Between October and December alone, the HeroRAT nursery welcomed 36 new baby rats, eager and willing to learn the ropes in one of our life-saving detection programs. In addition to the incredible progress of our teams, word of the HeroRATs’ amazing deeds spread all over the world again this year. This exciting exposure helped draw in fans of all ages, backgrounds, and nationalities, to join us in the fight against landmines and TB! A visit in June from APOPO’s Honorary President of the Board: Her Royal Highness, Princess Astrid of Belgium, to our headquarters in Tanzania and Mine Action Program in Mozambique, attracted a wave of media interest. APOPO’s Founder, Bart Weetjens, took to the airwaves to spread the word about the HeroRATs on RNW’s Earth Beat program (The Netherlands) in May, and Radio 774 ABC Melbourne (Australia) in September. Bart also shared our work at the Skoll World Forum in Oxford, where he was featured in this TakePart video, and at the more recent Ashoka Globalizer event in Vienna. The HeroRATs scurried across the small screen in front of an audience of 267,000 viewers, as part of a segment of Daily Planet which aired on Discovery Canada in September. Our social change-making, innovative detection rats were profiled by intrepid adventurers On the Up, It Began in Africa and Shamengo. A CNN crew visited our Mine Action Program in Mozambique to film a news story titled "The Hero Rats of Africa". APOPO’s original video entry, “Training HeroRATs to sniff out TB”, made it to the top 11 finalists (out of 141 entries) in McKinsey on Society’s Social Innovation Video Contest, and was then voted Second Winner by the public! Help us make “Peace on Earth” a reality! If you’re looking for a more meaningful Christmas gift than the usual knick-knacks and electronics, you’re in luck – a HeroRAT gift adoption helps make the world a better place, while being a hassle-free and instantly delivered gift, to relieve the pressures of last-minute holiday shopping! Click here to watch our holiday "Give a Rat" video. Our featured TB and Landmine Detection HeroRATs are not only super-skilled and extra lovable, they’re also articulate: adopters receive updates from their rat after the giving season is over, keeping them informed about their heroic work. By teaming up with Nala, Mojo, Cheeky or Blossom this season, you and your gift recipient are truly helping to make the dream of “Peace on Earth” a reality. To get the whole banana on the perks of adopting a rat for yourself or for others, check out our Adopt-a-Rat webpage and download our Adopt-a-Rat FAQ! There are a number of other inspiring initiatives for givers looking to lend a paw this holiday season, too. One way is to visit our project on GlobalGiving, which allows you to contribute a year's worth of banana treats for one of our rats - that's cause for a full-cheeks celebration! And if you'd like to support our work as a heroic holiday gift, check out the GlobalGiving Gift Card Challenge. For every 500 gift cards sold, something amazing will happen thanks to GlobalGiving's bonus grants - now that's the giving spirit! HeroRATs are naturally humble creatures, and this year, we’re more humbled than ever by the generosity of our friends around the world. APOPO's teams could not have come this far without the help you’ve given, and continue to give, throughout the holiday season. Thank you, and happy holidays! As the year is drawing to a close, so too are our team’s Mine Action efforts in the Gaza Province of Mozambique! Back in 2008, APOPO was tasked as the sole demining organization to continue clearance of the province. In early 2012, our Mine Action team is scheduled to complete clearance of all designated areas, well ahead of the 2014 deadline. With the help of HeroRATs, APOPO’s team has cleared over 1.9 million square meters of land in the Gaza Province alone, in the process ensuring the safe destruction of 1,762 landmines, 972 unexploded ordnance and 12,168 small arms and ammunitions. A total of 26 tasked areas have been cleared and released to the local community, while clearance efforts continue in two remaining areas. But the job isn’t over yet! APOPO is committed to helping Mozambique rid itself of its landmine problem by 2014. Next year, we will continue to assist with clearance operations in two of Manica Province’s southern districts, Mossurize and Machaze, covering a total area just over 1.6 million square meters. Vote for HeroRATs in the McKinsey Social Innovation Video Contest! The HeroRATs’ skill at hamming it up for the camera has paid off: we’re excited to announce that our video clip, “Training HeroRATs to sniff out TB,” has been selected as a Finalist in the McKinsey Social Innovation Video Contest! As part of their effort to “create a hub where [McKinsey] can highlight the incredible work taking place around the world,” McKinsey & Company asked social innovators, wherever in the world they might be, to create a one-minute-or-less video showcasing their ideas or solutions to social problems. We are honored that our entry, featuring the talents of our TB-sniffing heroes and longtime APOPO employee Peter, was selected as one of the top 11 finalists, out of 141 entries! Between November 30th and December 9th, the public is welcome to view all of the finalists’ videos and vote for their favorite! You can vote on one video, once per day, until the December 9th deadline. The three winning organizations with the most votes will be announced on December 12th. As incentives, the lucky final three will be included in a print edition of McKinsey's flagship publication What Matters, have a chance to be featured in a special TV program co-produced with Link TV & Viewchange.org, and will be honored at a networking reception in NYC where the Link TV program will be screened. As an added bonus, each finalist will be featured in The Huffington Post! Click here to watch all of the finalists’ videos, and cast your vote for the one you think showcases the best innovation and impact. Or, click here to vote for HeroRATs now – and every day until 9th December! In order to answer this question, the Summit aligns selected Fellows with a team of expert panelists, comprising some of the most accomplished social and business entrepreneurs in the world. The teams then spend three days developing the strategies needed to advance their ideas to effect greater social change. It’s a beautiful garden for a great cause: the Klaprozen voor Vrede (“Poppies for Peace”) project began in 2004, when Belgian ceramic artist Anita Huybens conceptualized, created, and exhibited more than 1,000 ceramic poppies to fundraise for APOPO. Although Anita sadly passed away in September 2008, Klaprozen voor Vrede continues to grow under the leadership of a team of volunteers, and their commitment to the APOPO cause remains strong. Earlier this month, we were grateful to receive a donation of 42,000 Euros thanks to their amazing efforts! Klaprozen voor Vrede is instrumental in raising both funds and awareness of the global landmine problem. In the past, the sale of these poppies – at 50 Euros each – enabled APOPO to purchase two brush-cutting machines, vital pieces of equipment for our Mozambique Mine Action team! The project continues Anita’s work by exhibiting the poppies at events throughout the year, and there are several permanent displays throughout Belgium; you can learn more about their locations here. If you are interested in purchasing a poppy, you may also download a PDF of their brochure (in English, French, and Dutch). We are truly touched by the Klaprozen voor Vrede project’s recent donation, and would like to thank all of the volunteers involved for their incredible support of our work! Hamoud (also known as Moudy) has been working with APOPO for five years, training HeroRATs at our headquarters in Tanzania. In January of 2011, he was among four Tanzanian trainers chosen to spend six months working with our Mozambique Mine Action team. Because this was his first trip to Mozambique, Hamoud was excited to see how his work in Tanzania was implemented, and while there, he was determined to learn all he could from the Mozambique Mine Action team. “It’s important to interact well,” he says, “and you must get used to the new language and new people. You can’t take the culture from Tanzania and bring it to Mozambique. They [the team] are used to working there, so you must listen to them and implement their advice.” In order to listen, he had to first learn their language. Mastering Portuguese, he says, was one of his proudest accomplishments. Night of a Thousand Dinners (N1KD) is a student-run gala dedicated to raising awareness of the global landmine crisis and its devastating effect on international communities. The International Relations Students Association (IRSA) of the University of British Columbia in Vancouver, Canada, recently held their 9th Annual N1KD event. This year, the IRSA chose to highlight the work of APOPO’s mine detection HeroRATs at their gala! About 230 people attended the event on 21 November, which featured a silent auction, a string quartet performance, a mouth-watering three course dinner, and a presentation on the mine action efforts of APOPO. A video message came all the way from HeroRAT headquarters in Tanzania, featuring APOPO’s Founder, Bart Weetjens, who expressed gratitude to the audience for being a part of such a wonderful initiative. A huge thanks to the IRSA team for all the time, energy and enthusiasm they put into organizing this event: we appreciate their efforts to bring the global problem of landmines into the spotlight and offer support for mine action efforts around the world. Give a rat, help save lives this holiday season! Move over, Kindle and iPad: this season’s hottest holiday gifts have four legs, long tails, and sniffers even more useful than that of Rudolph the Red-Nosed Reindeer. Their names are Nala, Cheeky, Blossom, and Mojo, and supporting their life-saving work through a HeroRAT Gift Adoption is a hassle-free way to bring holiday cheer to anyone on your gift list! Lucky gift recipients will be warmly welcomed into our Adopt-a-Rat program with a snazzy adoption certificate and welcome letter introducing them to their brand-new HeroRAT. Throughout the year, they will also be able to enjoy regular progress reports lovingly written and emailed from their adopted rat. A HeroRAT adoption truly is a gift that continues to give. Long after the presents have been unwrapped and thank you cards have been sent, our HeroRATs will still be doing their life-saving detection work – and bringing cheer wherever they go! For more info, email us at herorats@apopo.org. On behalf of the HeroRATs, we wish you a safe and peaceful lead-up to the festive season! In an exciting new development, APOPO’s proposal to expand our Tuberculosis (TB) Detection Program into Mozambique was approved by the Flemish Government. Minister-President Kris Peeters announced on October 21st that APOPO will be awarded a grant of 590,000 Euros to implement the first phase of a project designed to accelerate TB case detection in Mozambique. Increasing the detection rate of TB patients remains one of the main challenges to combat this fast spreading disease. Mozambique has a high incidence of TB, with an estimated 431 cases per 100,000 people (World Health Organization, 2007) and remains in the list of high TB burden countries. In the short term, APOPO aims to significantly increase the rate of new TB case findings in Mozambique by replicating the success of our TB Detection Program in Tanzania. APOPO’s detection rats technology meets the seven top priorities required for a diagnostic method, as determined by the TB diagnostic group of the World Health Organization.The first phase of this exciting new project will involve implementing collaboration agreements, establishing an operational TB detection capacity, and evaluating the established operation. APOPO is grateful for the ongoing support of the Flemish Government, in furthering our efforts to provide an efficient and reliable solution to this global public health challenge. Earlier this year, TakePart travelled to the Skoll World Forum in England to pick the brains of the world’s biggest thinkers. The resulting video series of these “Innovators in Action” showcases their ideas, enthusiasm, and solutions for creating a better world. You can view Bart’s interview, along with many other “Innovators in Action” working to improve our world, on the TakePart website here: http://www.takepart.com/video-series/skoll-world-forum. This month, APOPO’s HeroRATs stepped out to join the celebrations of Tanzania’s Uhuru Festival, marking the 50th Anniversary since independence! APOPO was invited by partner organization, the National Institute for Medical Research (NIMR), to share a display booth providing information about APOPO’s Tuberculosis (TB) Detection Program during a week-long event hosted by the Ministry of Health. HeroRAT trainers Haruni and Mark showed great national pride in demonstrating the skills and efficiency of our Tanzanian-born TB detection rats. In a series of training sessions, our expert sniffer rats screened line-ups of human sputum samples and were able to accurately indicate which samples were TB-positive. While the rats took a rest in between sessions, footage of APOPO’s work was displayed on a monitor and staff was at hand to answer the questions of many curious visitors. Our HeroRATs stole the spotlight as one of the most popular displays at the event, regularly drawing large crowds of onlookers – including none other than the Permanent Secretary of the Ministry of Health and Social Welfare, Dr. Blandina S.J. Nyoni, who was impressed with the sensitivity of APOPO’s innovative diagnostic method! APOPO is grateful for the opportunity to attend this event and raise awareness about the TB problem. We forward to continuing a strong and productive partnership with NIMR, as together we strive to increase TB case findings in Tanzania. A mine action workshop on “Enhanced Operational Approaches through the Application of Land Release Methodology” took place last month in Siem Reap, Cambodia. The workshop was hosted by the Cambodian Mine Action and Victim Assistance Authority (CMAA) in cooperation with the Cambodian Mine Action Centre (CMAC), the Norwegian People's Aid (NPA) and the Geneva International Centre for Humanitarian Demining (GICHD). Among those in attendance was APOPO’s Thailand Program Manager, Andrew Sully, who presented the preliminary results of the APOPO-PRO Mine Action team’s survey progress along the Thai-Cambodian border. After ten weeks of surveying an area of approximately 30 square kilometers, APOPO-PRO’s Technical Survey (TS) intervention teams located 165 anti-personnel mines and 17 anti-tank mines. These items were found during targeted investigations of Non-Technical Survey (NTS) information. The team also determined that 40% of land could potentially be re-classified as Confirmed Hazardous Areas (CHA), while 35% of land could potentially be re-classified as either Cancelled Land (16%) or Area With Restriction (19%). These preliminary results are promising, but a long-term strategy is needed to help Thailand rid itself entirely from its landmine problem. APOPO-PRO intends to implement a full cross-border mine action approach in Thailand and Cambodia, provided the necessary funding is secured. If successful in attaining this much-needed support, a team of trained Mine Detection Rats will be deployed to South East Asia to assist in speeding up clearance efforts in the region. For more information, please contact APOPO-PRO Program Manager, Andrew Sully. On behalf of the entire APOPO team, we’d like to extend our best wishes to everyone affected by the devastating floods in Thailand. One good thing a day – that’s the promise of GOOD. Over 180,000 online subscribers receive “the daily GOOD” newsletter in their email inbox each day, and last month our giant rats were lucky enough to be the GOOD topic of the day! In their email, GOOD raised the question: Could Giant Rats Eliminate Landmines in Thailand? The effect of the email and its counterpart post online was instant, with more than 330 responses via the website and Twitter, as well as over 700 recommendations via Facebook. It seems if the public had their way, a team of APOPO’s trained Mine Detection Rats and handlers would be on the next plane to South East Asia! To view the article & comment stream online, or to get the daily GOOD, click here. In their own words, "GOOD is a collaboration of individuals, businesses, and nonprofits pushing the world forward. Since 2006, they've been making a magazine, videos, and events for people who give a damn. The GOOD team cares about what works – what is sustainable, prosperous, productive, creative, and just – for each and every one of us." Visit www.good.is for more. APOPO is excited to announce that our website is now available in German! With this new linguistic offering, we hope to spread the word of APOPO’s life-saving riesenhamsterratten to all of our German-speaking supporters around the globe. We’d like to thank our dedicated team of German-speaking volunteers, who worked tirelessly to translate and edit our entire website text. A round of applause for Agapi, Benjamin, Christine, Dirk, Domenique, Fatima, Katharina, Katrin, Maren, Mario, Sarah, Sebastion, Stefan, Susette, and Wencke! The HeroRAT team would also like to extend a special hero-sized thank you (and several years’ worth of banana treats) to journalist and HeroRAT adopter Claudia Müenster, who not only translated much of our text but also worked around the clock to proofread all of our website for accuracy and consistency. We, along with our German fans, extend our deepest gRATitude to all those who volunteered their time and skills to make this translation happen! You can visit the new German website here: http://www.apopo.org/home.php?lang=de. Thanks to all of our fabulous Facebook fans who took part in our online Vote-a-Rat contest – and had the rare opportunity to suggest names for the new faces of APOPO’s Adopt-a-Rat program! Our four beloved HeroRATs, Kim, Tyson, Ziko and Chosen One have enjoyed their tenure as rats featured for adoption on our website. While they will continue to save lives and limbs and mail updates to their legions of loyal adopters, they are graciously stepping out of the limelight to allow four young HeroRATs to share their training journeys with our Adopt-a-Rat community. Visit our Facebook page to meet the fresh new faces of our Adopt-a-Rat program, who will soon appear on our website for adoption – and join us in wishing them every success as they commence their heroic training journeys! Many thanks for your ongoing support as we work towards creating a safer, healthier and better world for all. Help HeroRATs earn bonus bananas on October 19 Bonus Day! We need your help on GlobalGiving's LAST Bonus Day of the year, this Wednesday, October 19th! Starting at 12:01 am EDT, all donations to our NEW project, Train HeroRATs for Life-Saving Detection Missions, will be generously matched by GlobalGiving at 30%! We truly appreciate your ongoing support & belief in our HeroRATs! Welcome to the HeroRATs' new home on GlobalGiving! Since 2008, APOPO’s HeroRATs have been honored to be a part of the GlobalGiving community. Now, we’re excited to welcome you to our brand-new project page: “Train HeroRATs for Life-Saving Detection Missions”! Already, the super-sensitive noses of our HeroRATs have helped to release millions of meters of mine-free land to communities in Mozambique, increase tuberculosis case findings in Tanzania, and further the reach of APOPO’s life-saving efforts in new regions. But while there are still global problems to sniff out, there are still HeroRATs to train! A hero’s work is never done, and this page is the new home for our heroes on GlobalGiving. Here you’ll find regular Project Reports on APOPO’s work, up-to-date information, fun photos, and new contribution options that go directly towards supporting all aspects of HeroRAT-hood! Feel free to also join to our mailing list, like us on Facebook, and follow us on Twitter for all the latest heroic happenings. Thank you for your interest in our work. Together, we will train more HeroRATs for life-saving detection missions!